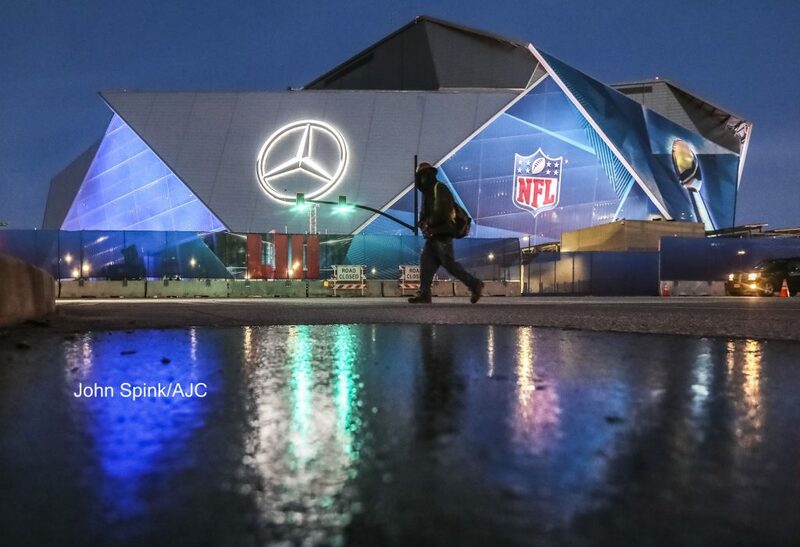 What a great time it was shooting Super Bowl LIII at Mercedes-Benz Stadium here on our own turf. 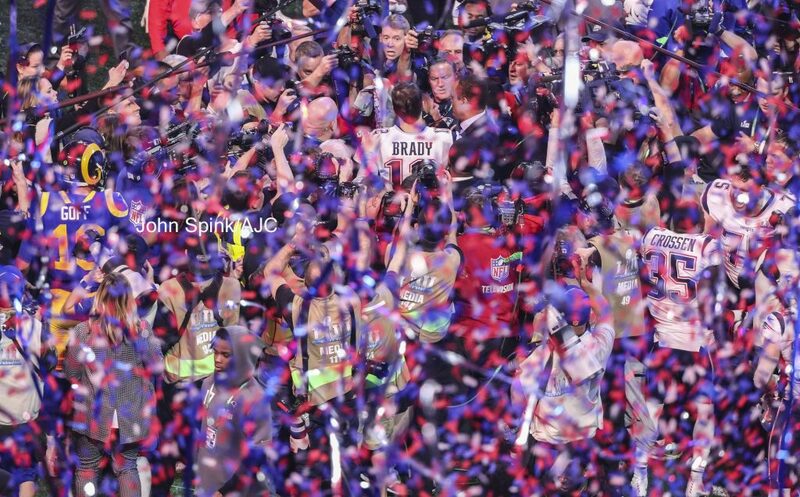 It was just two years ago the AJC Photo crew went to Houston for SBLI to cover the Falcons loss to the Patriots. This time around, from my perch high above the field with a Canon EF 800mm f/5.6L IS USM – we came up with some really interesting images. For starters let’s look at the Sports Cover of the AJC below followed by the AJC Front Page next. 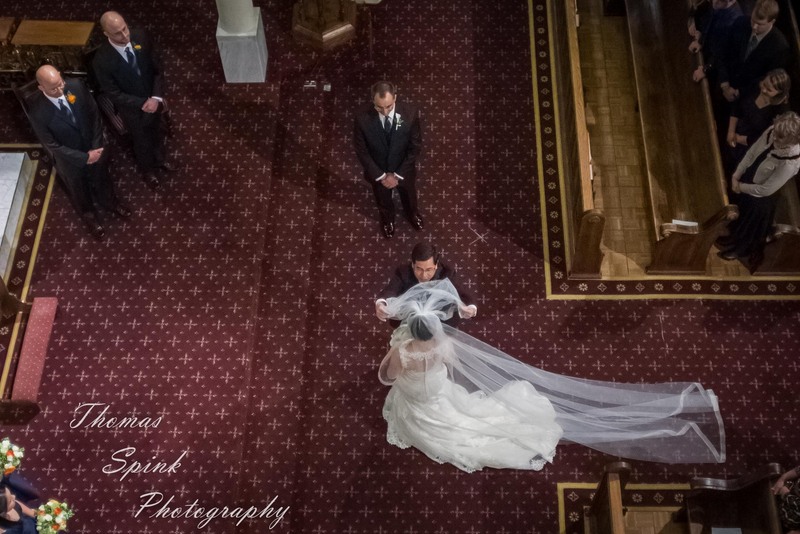 Avoiding the scrum and the trench perspective, our view from above worked quite well. Let’s scroll through some images – shall we? 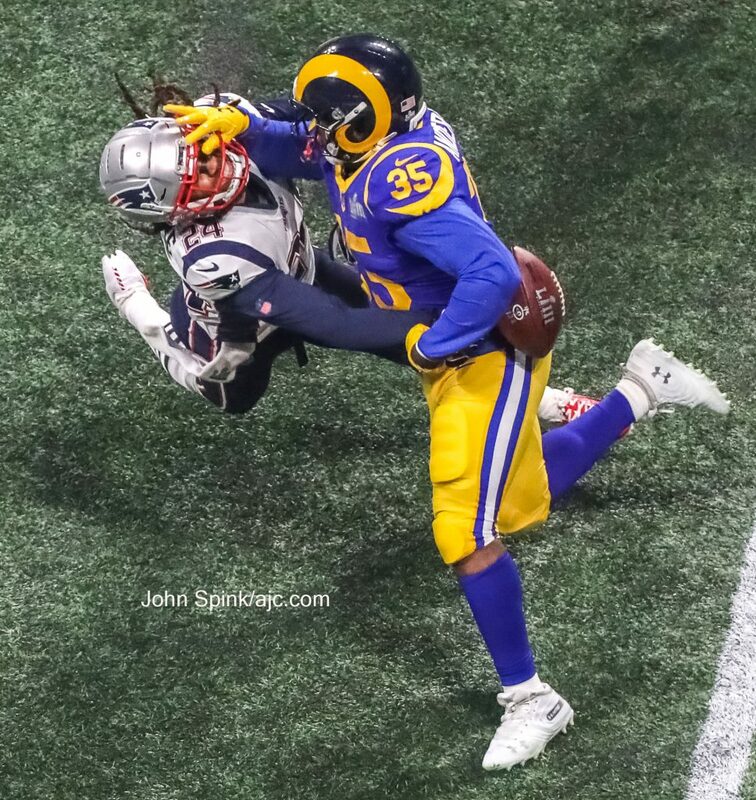 Rams running back C.J. Anderson (35) in the fourth quarter. 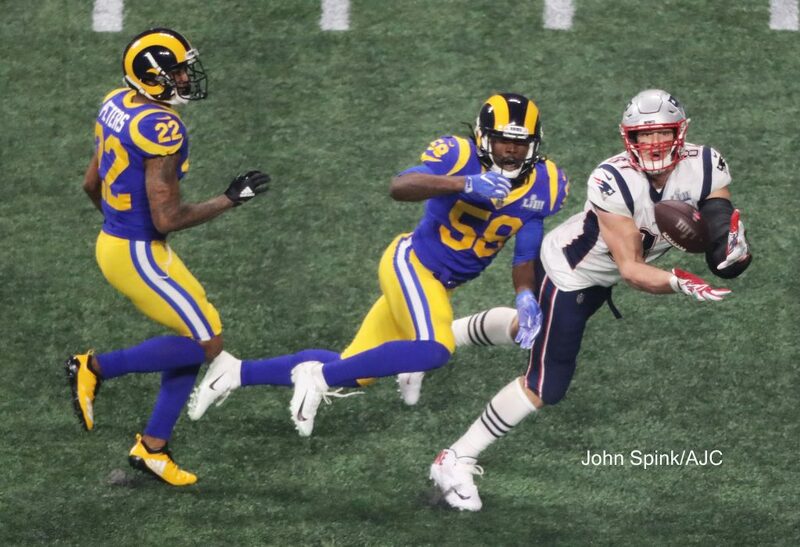 New England Patriots wide receiver Chris Hogan (15)(left) can’t get to this pass as Los Angeles Rams cornerback Marcus Peters (22)(right) knocks the ball away during the 3rd quarter . 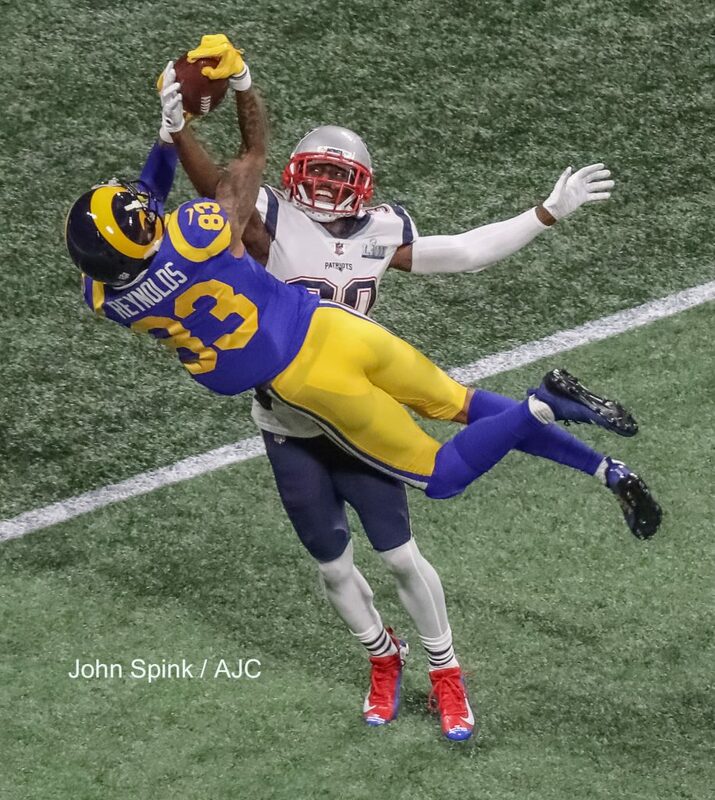 Los Angeles Rams wide receiver Josh Reynolds (83)(left) can’t hold onto a pass as New England Patriots cornerback Jason McCourty (30) knocks it out of his hands during 2nd quarter action. 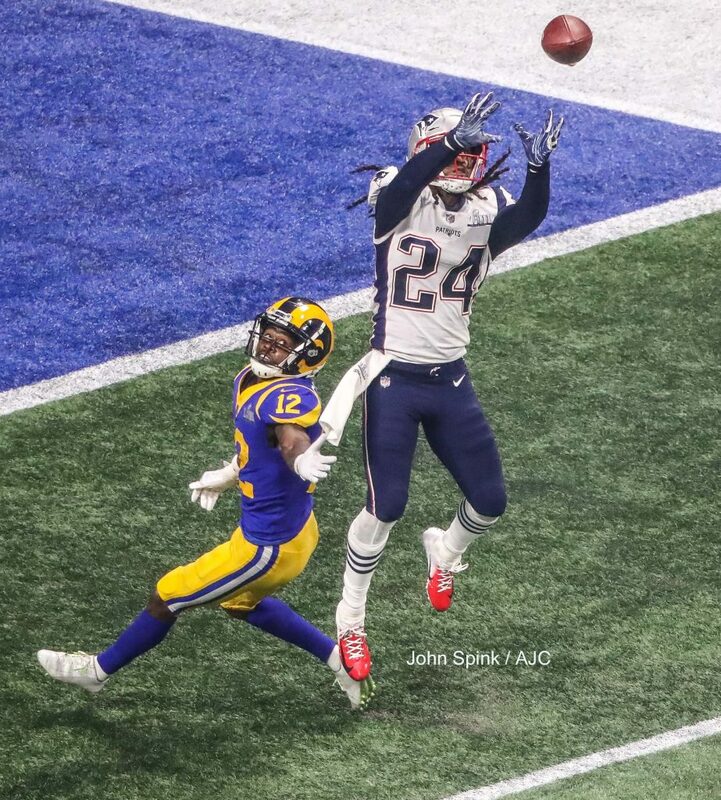 New England Patriots cornerback Stephon Gilmore (24) gets an interception in the fourth quarter. New England Patriots tight end Rob Gronkowski (87) makes a catch in the fourth quarter. New England Patriots quarterback Tom Brady (12) throws a pass in the second quarter. 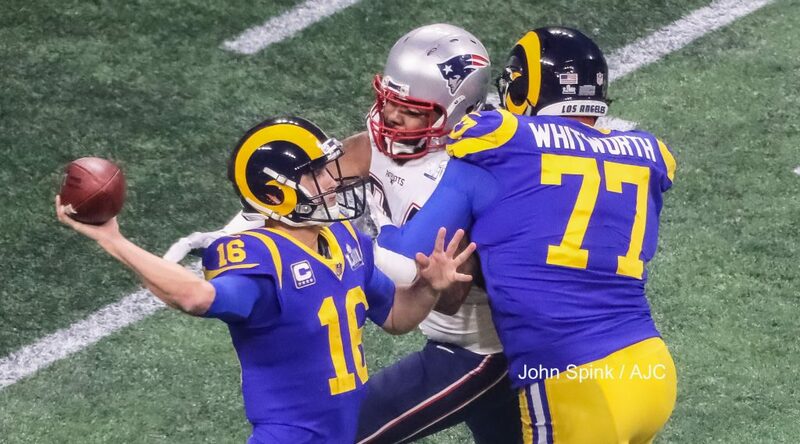 Los Angeles Rams quarterback Jared Goff (16)(left) releases a pass as New England Patriots defensive end Adrian Clayborn (94) closes in while Los Angeles Rams offensive tackle Andrew Whitworth (77) during 3rd quarter play. 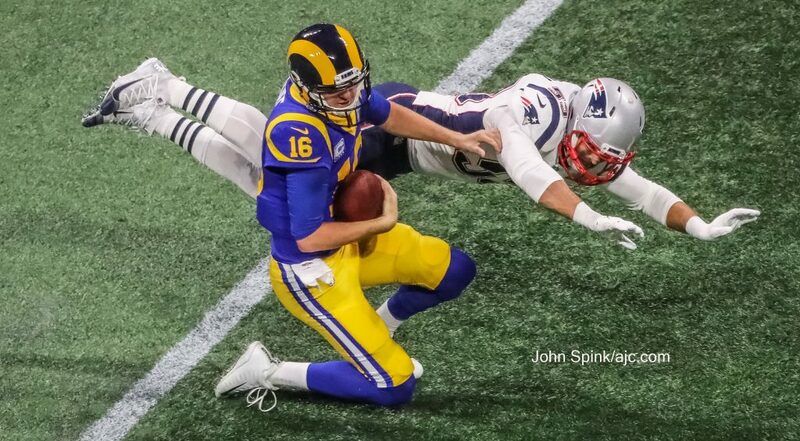 Los Angeles Rams quarterback Jared Goff (16) throws the ball away after pressure from New England Patriots middle linebacker Kyle Van Noy (53). 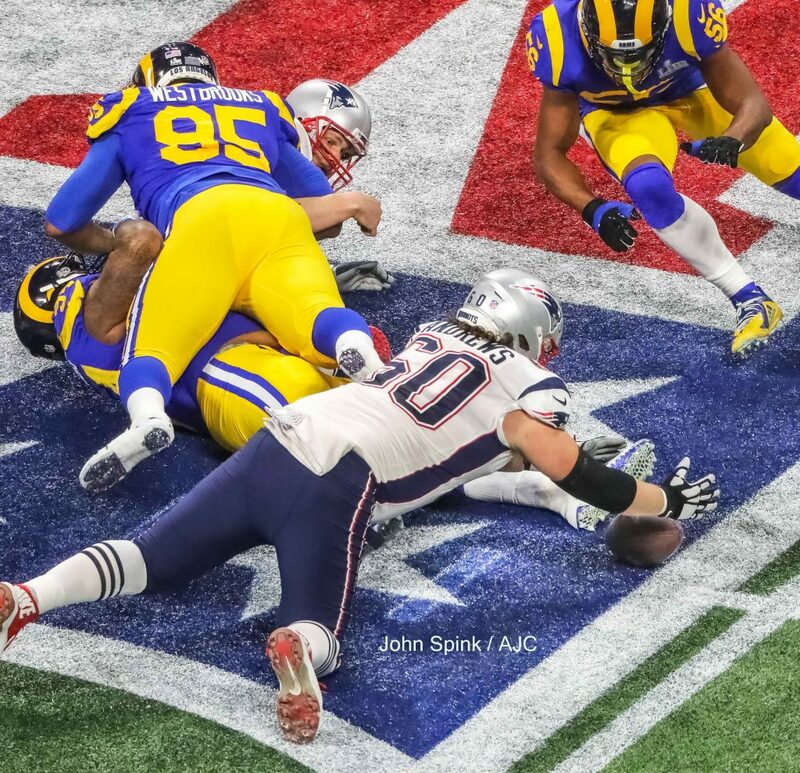 Los Angeles Rams defensive end John Franklin-Myers (94) and Los Angeles Rams defensive tackle Ethan Westbrooks (95) pile on New England Patriots quarterback Tom Brady (12) (left) after he fumbles the ball while New England Patriots center David Andrews (60) dives on it (below) as Los Angeles Rams linebacker Dante Fowler (56) (right) moves in during 1st quarter action. 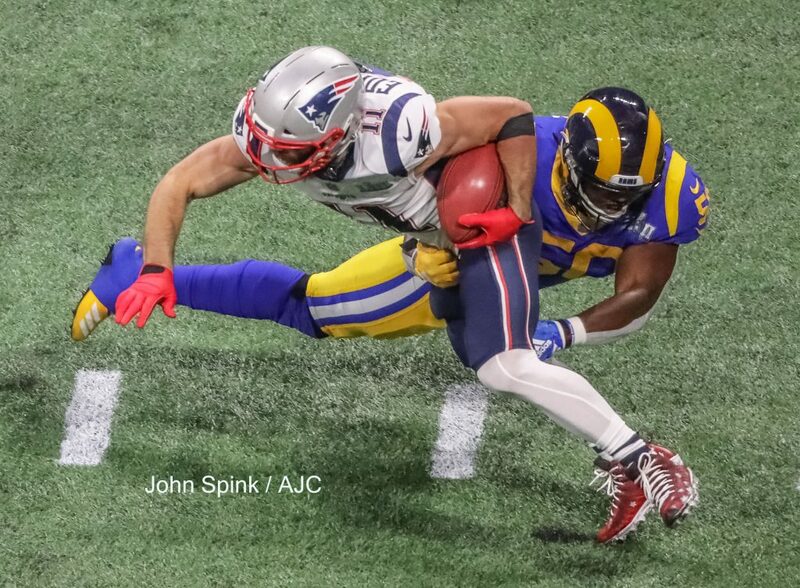 New England Patriots wide receiver Julian Edelman (11) returns a punt in the first quarter. 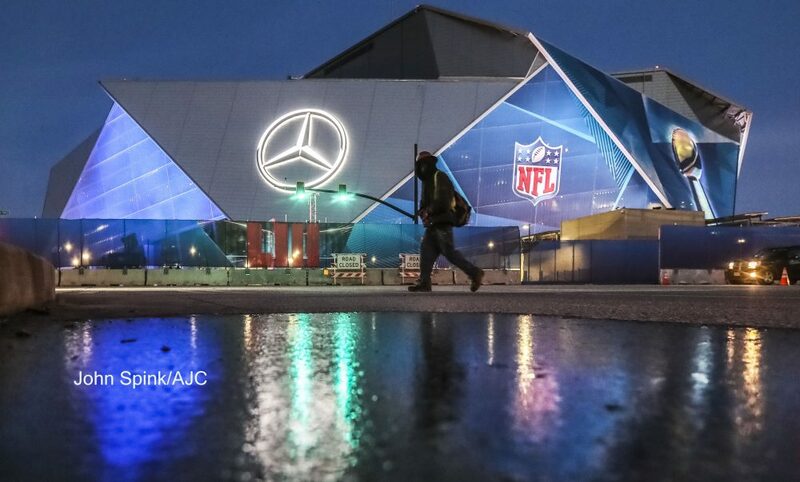 The New England Patriots played the Los Angeles Rams in the Super Bowl at Mercedes-Benz Stadium in Atlanta. 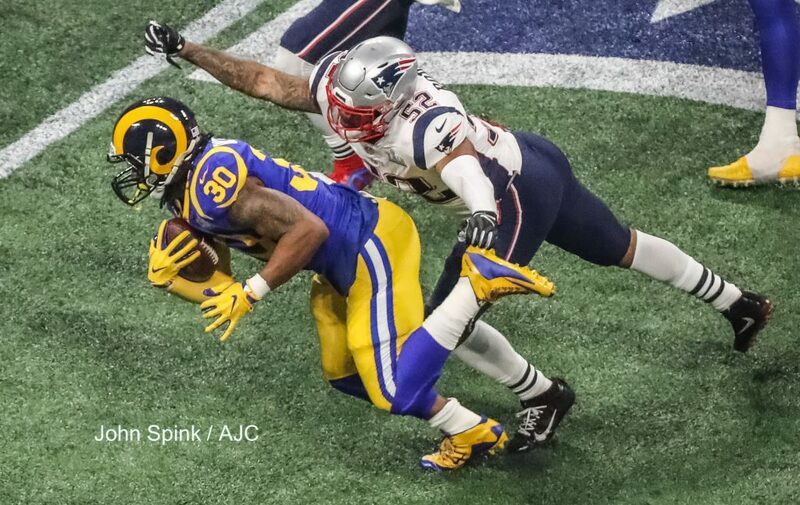 Los Angeles Rams running back Todd Gurley (30) runs from the clutches of New England Patriots outside linebacker Elandon Roberts (52)(right) during 4th quarter play. 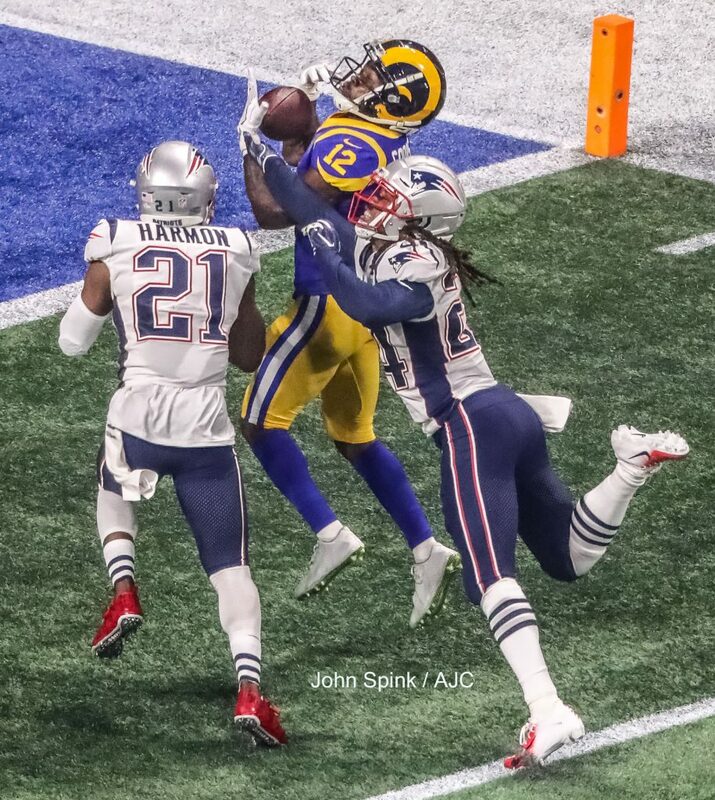 New England Patriots wide receiver Cordarrelle Patterson (84) makes a catch over Los Angeles Rams cornerback Marcus Peters (22) in the second quarter. 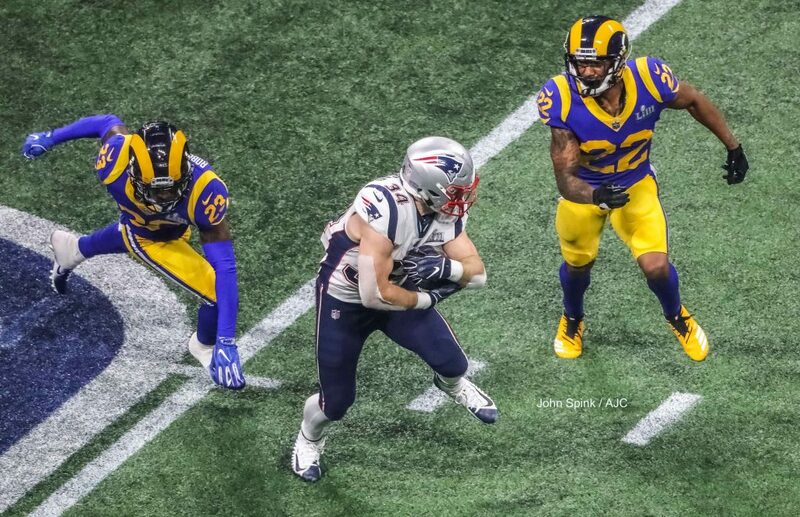 New England Patriots running back Rex Burkhead (34) scrambles for yardage in the fourth quarter. 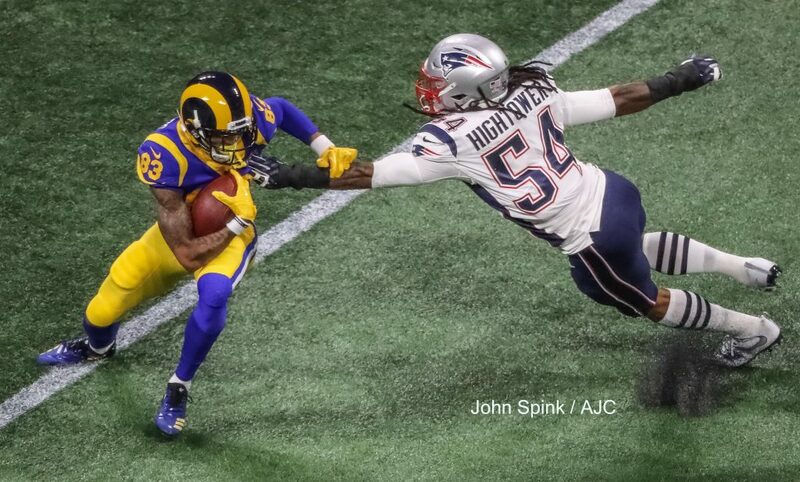 Los Angeles Rams wide receiver Josh Reynolds (83) (left) tried to negotiate New England Patriots outside linebacker Dont’a Hightower (54) (right) during first quarter action. 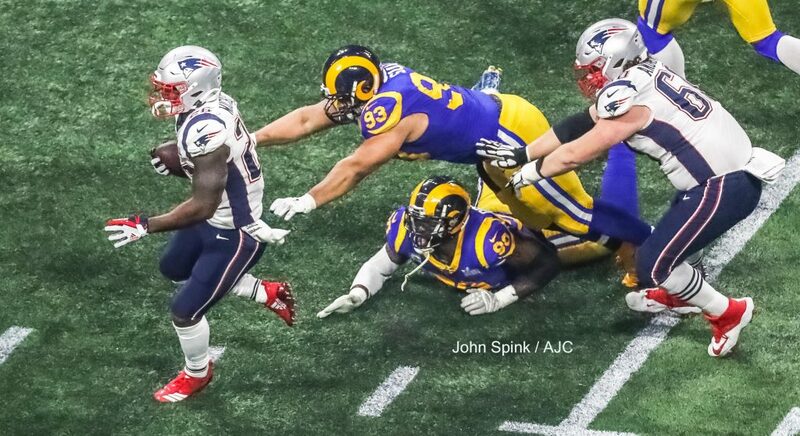 New England Patriots running back Sony Michel (26) (left) passes by Los Angeles Rams nose tackle Ndamukong Suh (93) and Los Angeles Rams defensive end Michael Brockers (90)(center) as New England Patriots center David Andrews (60)(right) looks on during 3rd quarter play. 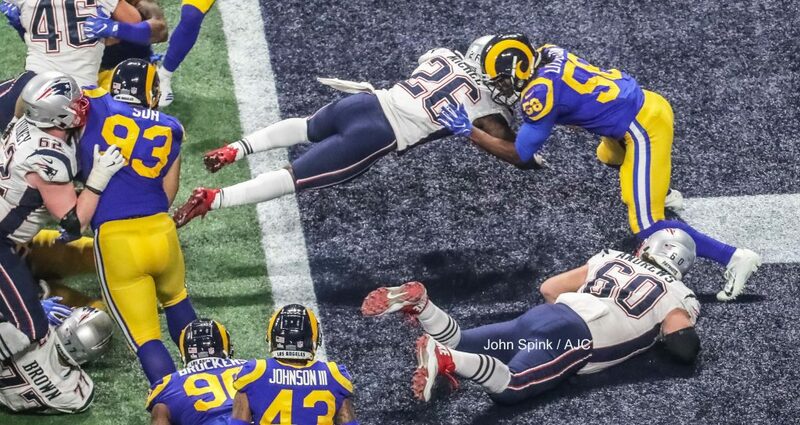 New England Patriots running back Sony Michel (26) gets a first down in the fourth quarter. 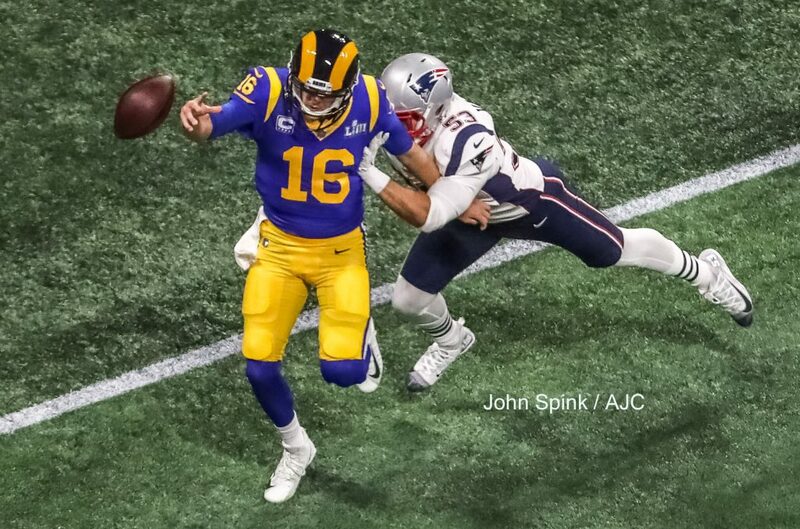 The New England Patriots played the Los Angeles Rams in the Super Bowl at Mercedes-Benz Stadium in Atlanta. 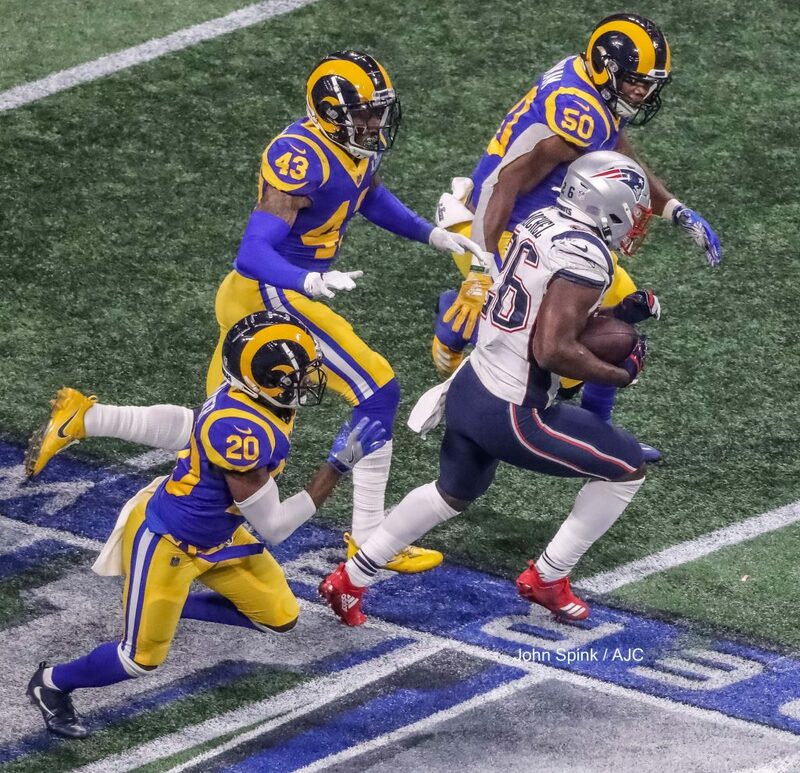 New England Patriots running back Sony Michel (26) rushes for a fourth quarter TD to take the lead and the win. 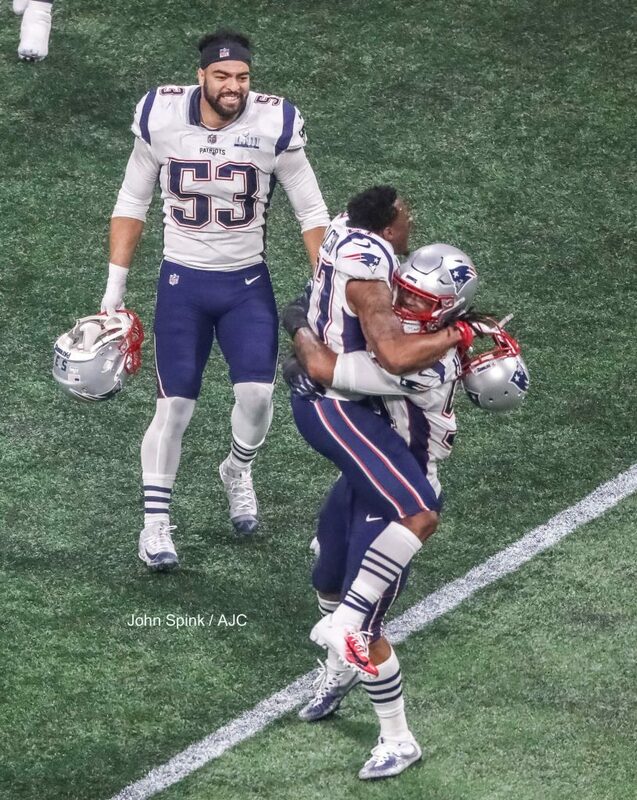 New England Patriots middle linebacker Kyle Van Noy (53) moves to join in a early celebration with teammates, New England Patriots defensive back J.C. Jackson (27)(center) and New England Patriots outside linebacker Dont’a Hightower (54)(right) as the clock winds down. 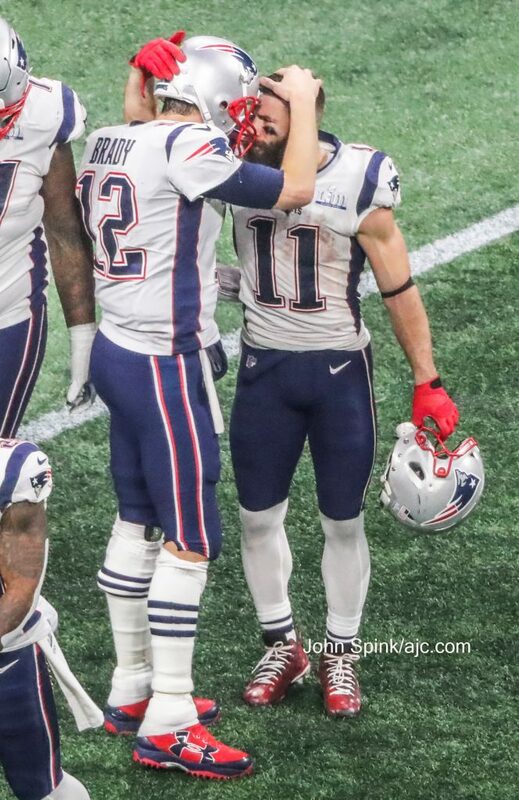 Brady and Edelman celebrate as seconds are left on the clock on Sunday Feb. 3, 2019 at the Super Bowl between the New England Patriots and the L.A. Rams at Mercedes-Benz Stadium in Atlanta. 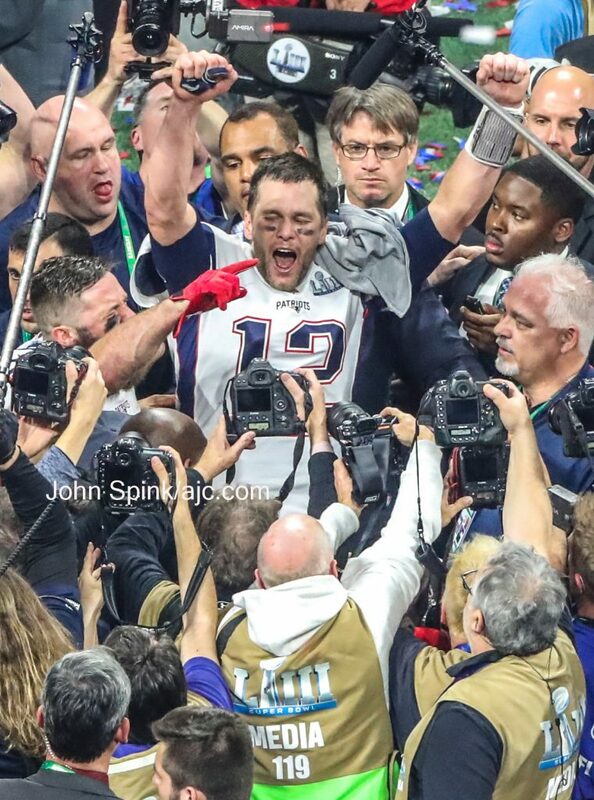 Brady celebrates victory on Sunday Feb. 3, 2019 at the Super Bowl between the New England Patriots and the L.A. Rams at Mercedes-Benz Stadium in Atlanta. 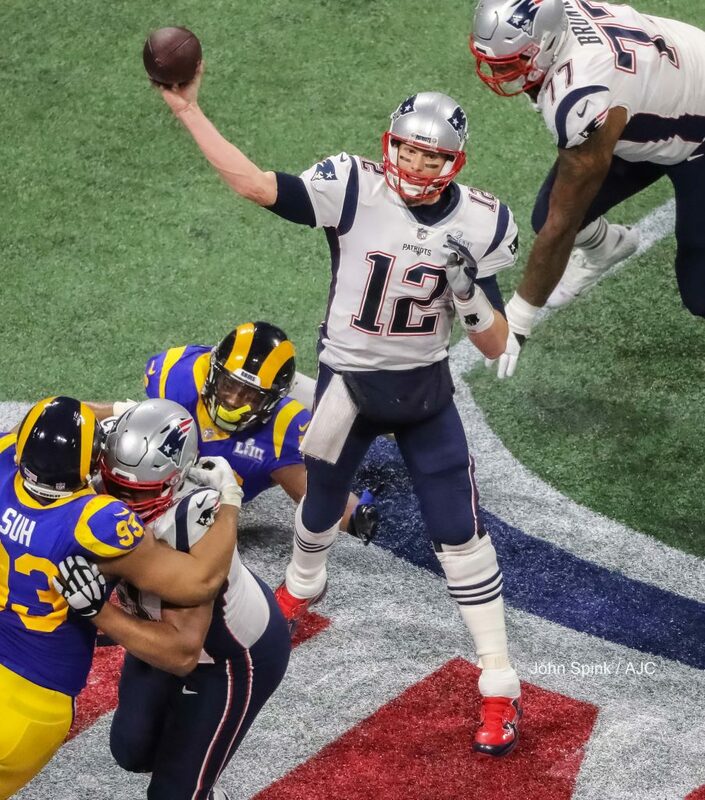 Los Angeles Rams quarterback Jared Goff (left) tries to make his way to New England Patriots quarterback Tom Brady (right) in a shower of confetti. It was great to be able to shoot the events and the game, but seeing old friends and collegues made the experience that much more. Pulitzer Prize winning photographer, John Filo was in town with CBS who presented the Big Game this year. 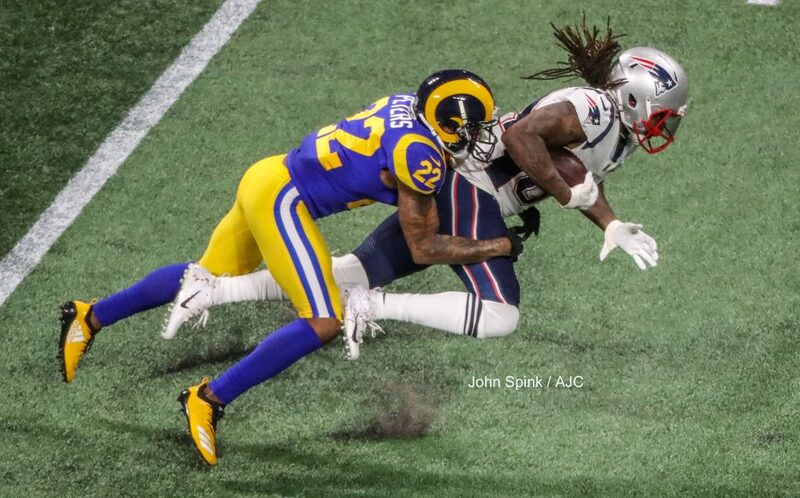 John is now Vice President of CBS Photography. 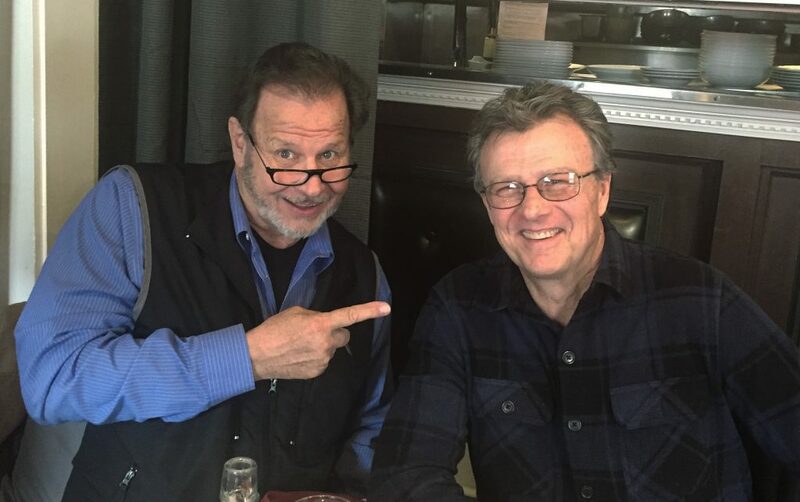 We met for lunch at Pasta Da Pulcinella in Midtown to catch up with each other. I was an AP stringer back in the day when John ran the AP Bureau in Kansas City. 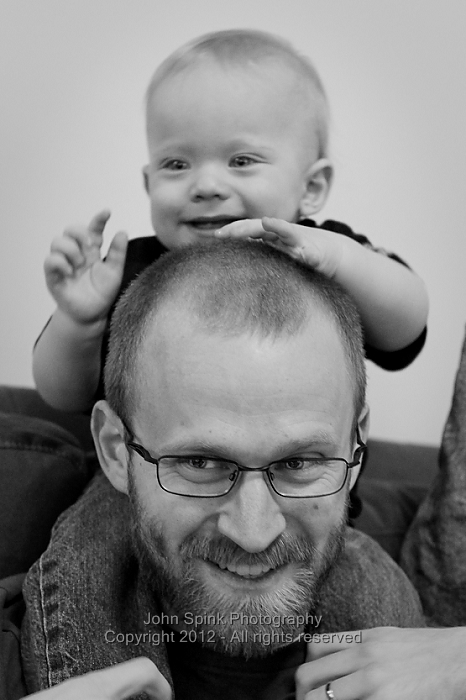 He was my mentor and teacher – and I still shoot sports with the Filo philosphy. So seeing John again really made my week. 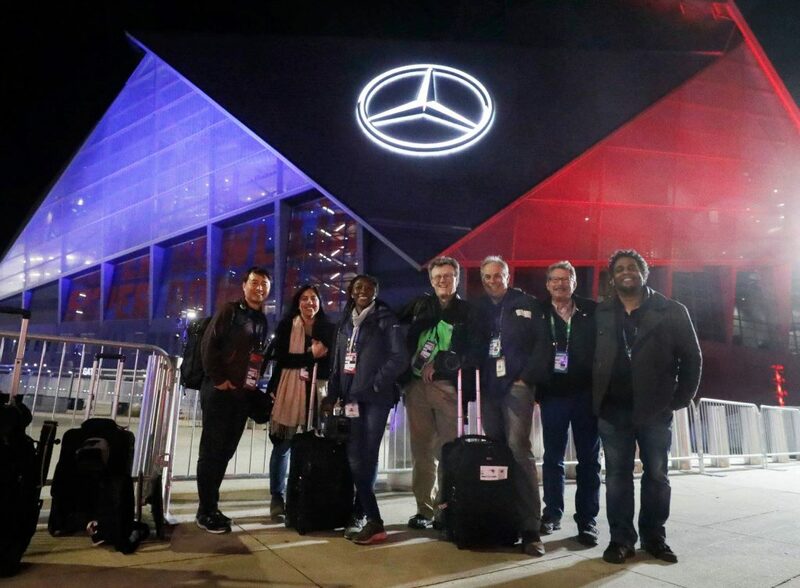 Left to Right – Hyosub Shin, Bita Honarvar, Alyssa Pointer, John Spink, Bob Andres, Curtis Compton and Ryon Horne together after Super Bowl LIII at Mercedes -Benz Stadium in Atlanta, Georgia. Senior Visual Manager, Sandra Brown is not pictured here because she was busy putting together some of the most beautiful photo pages we’ve seen in a long time. 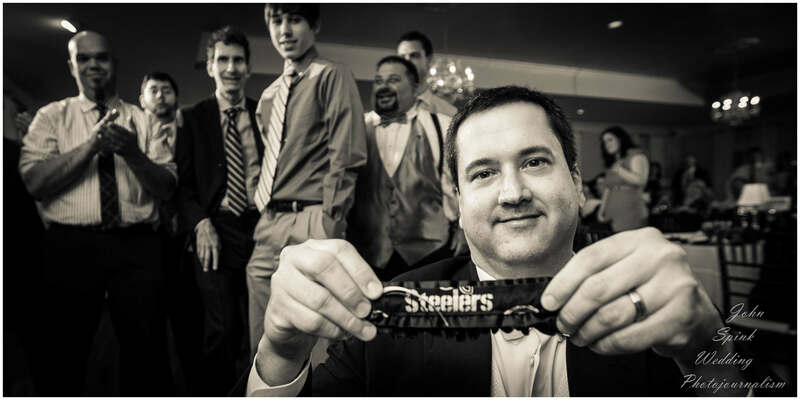 Weddings are not always so black & white. 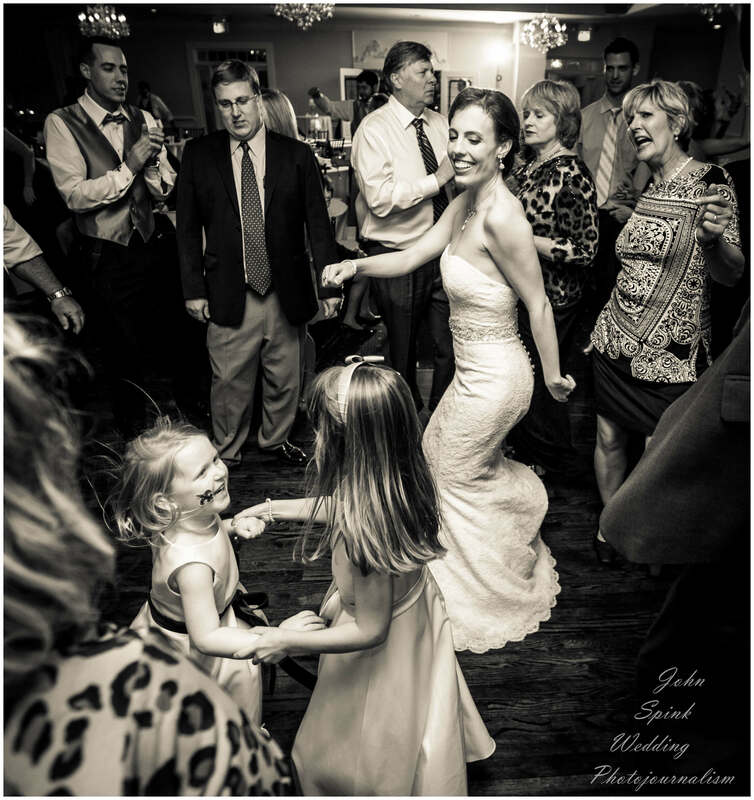 When it comes to planning, budget, food, the guest list etc., what starts off as a simple celebration can quickly turn into a quagmire of unforeseen issues. For pictures on the other hand, black and white – is black and white, even when the entire take is shot in color. 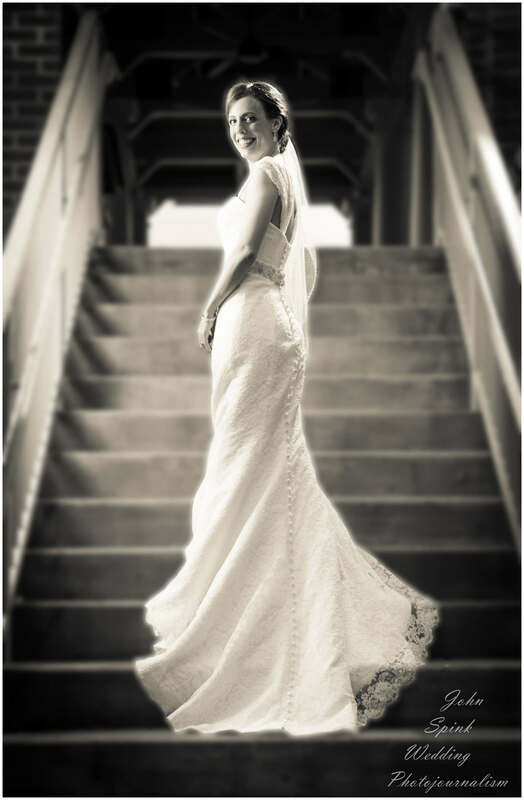 Yes, there is some creative time involved in wedding post-production with adjustments – but some beautiful results occur there bringing some great results. 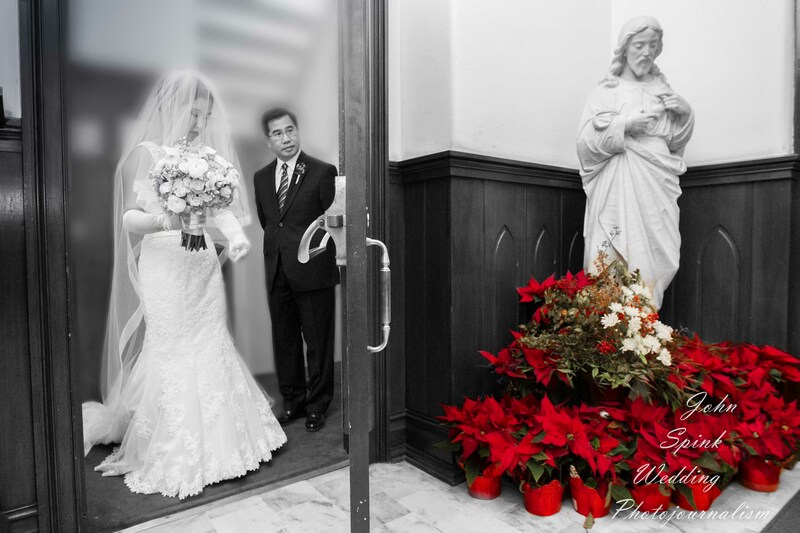 Ron and Regina were married at St. Peter Chanel Catholic Church in Roswell, Georgia. Built just after the turn of the millennia, this is a large church and has a traditional feel to it, without the poor lighting symptoms that plague other older churches. 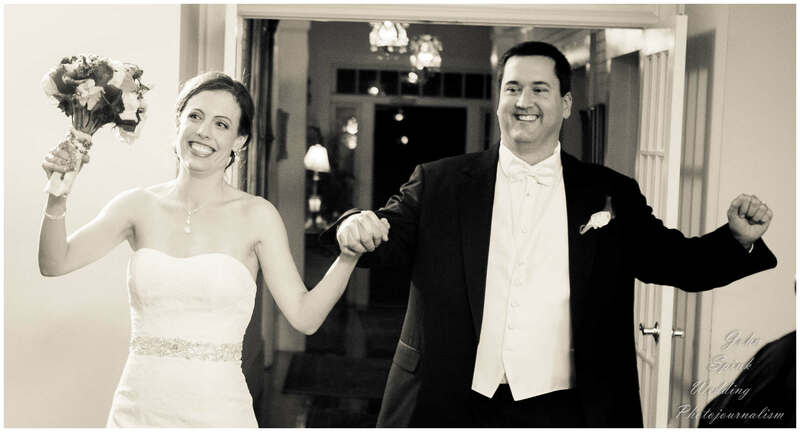 The reception was held at Founders Hall that kicked into high gear with some Louisiana, New Orleans style partying with handkerchiefs, parasols and temporary fleur-de-lis tattoos. 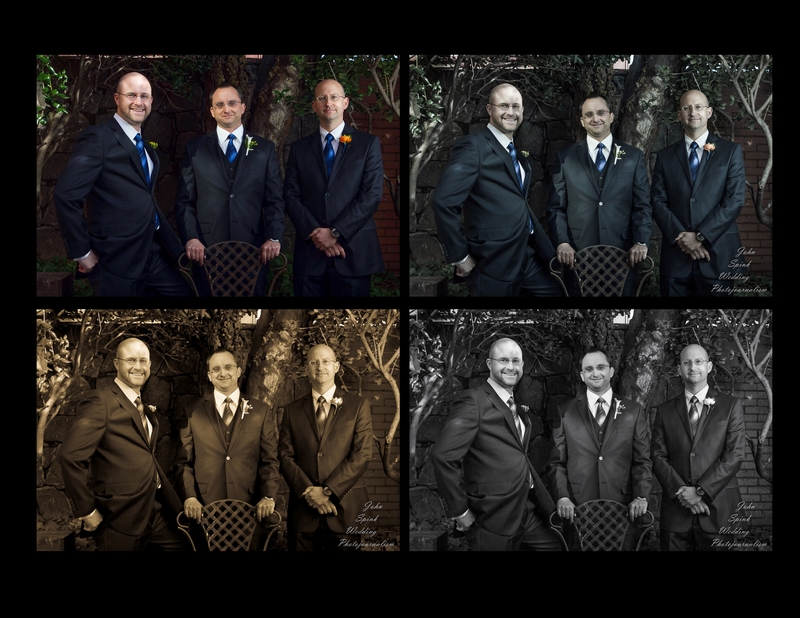 There are a variety of choices when it comes to how you want your pictures to look. 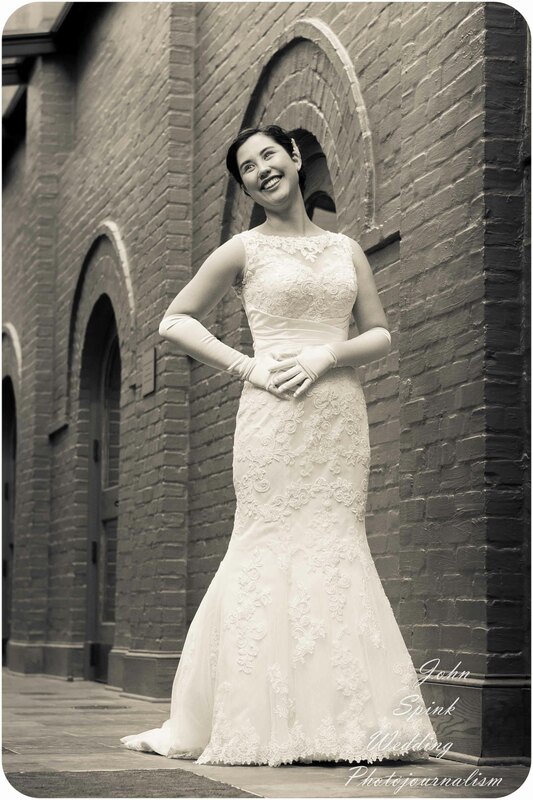 There are some investment additions when looking at black and white or tinted photos – but if your photography tastes are suited for these artistic expressions, they are well worth exploring. 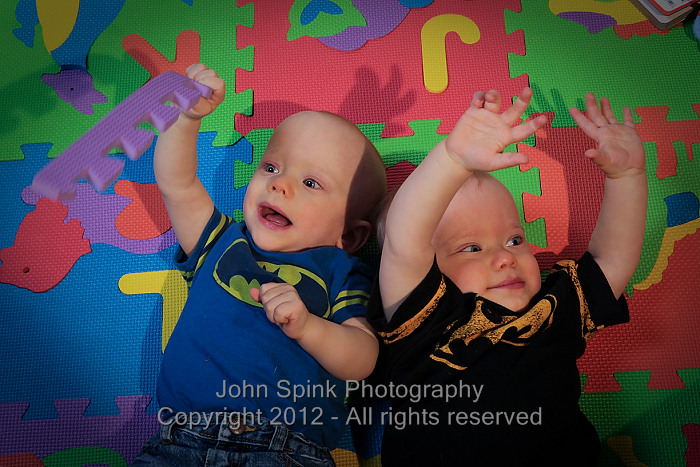 Just ask me about how we can make your images tailored to your needs. 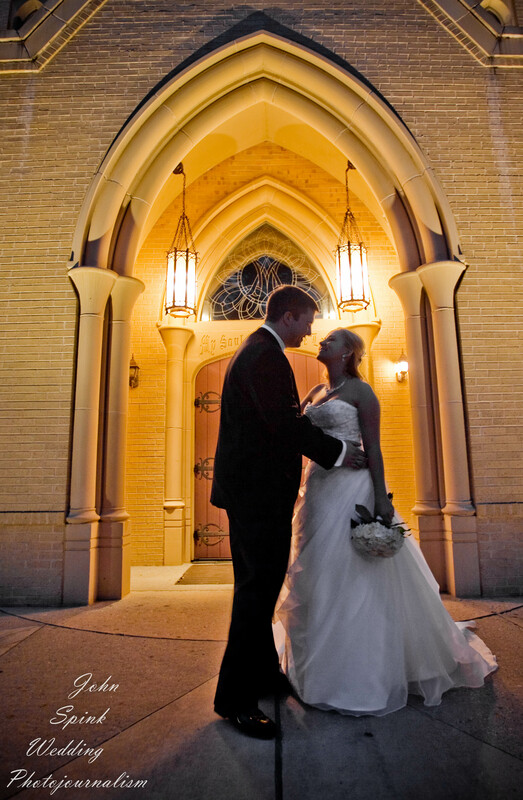 Chris & Alexandra in front of Our Lady of the Assumption Catholic Church in Brookhaven, Georgia. Love the mood of this and the architecture. 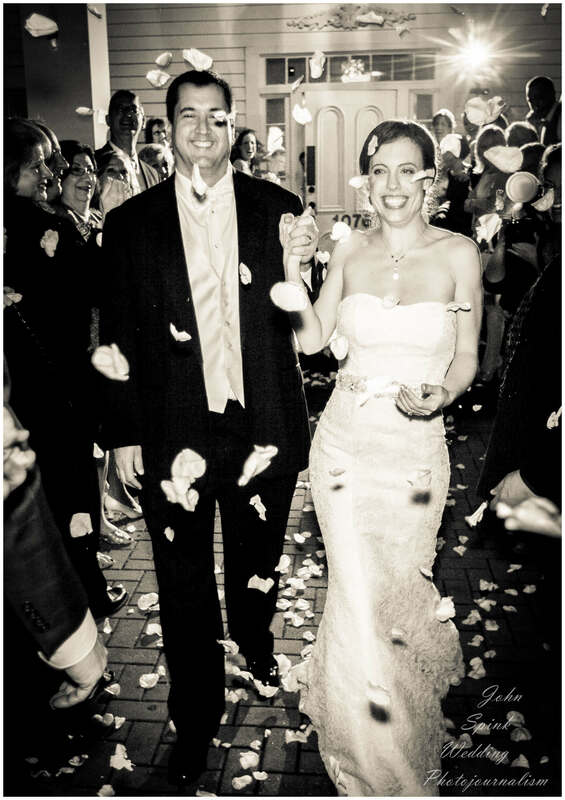 Picking a wedding venue for your wedding says a lot about you as a couple. And so it was with John and Elizabeth. 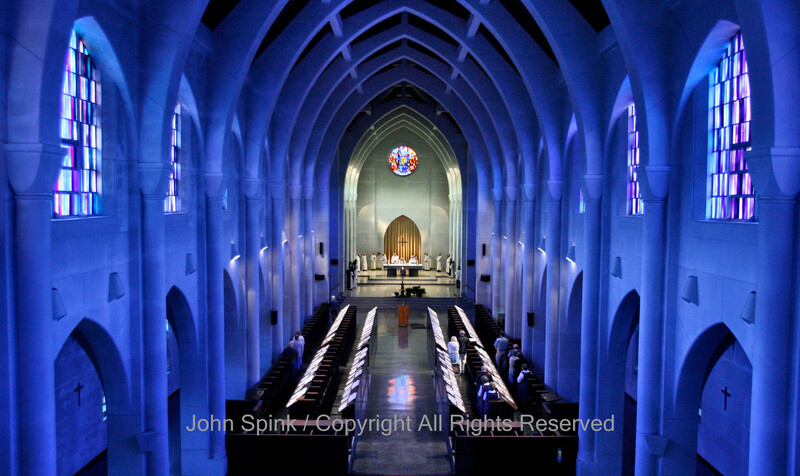 The Basilica of the Sacred Heart of Jesus, located in downtown Atlanta, Georgia was a first choice. Why? 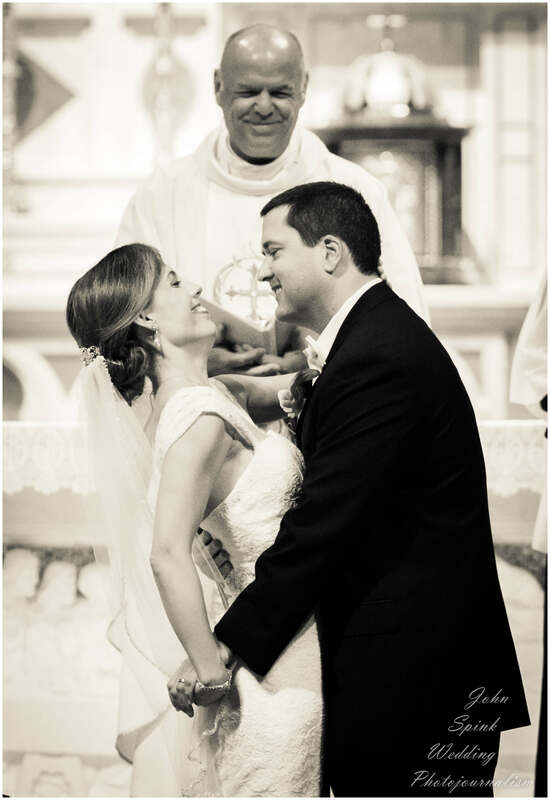 Several reasons came to mind for this couple; their professional work within the Church and wanting their wedding to be held at a church that is designated a Basilica. So what is a Basilica? We’re talking about the Catholic designation and not the architectural – so the simple explanation is – that it is a Catholic church that has been accorded certain privileges by the pope. 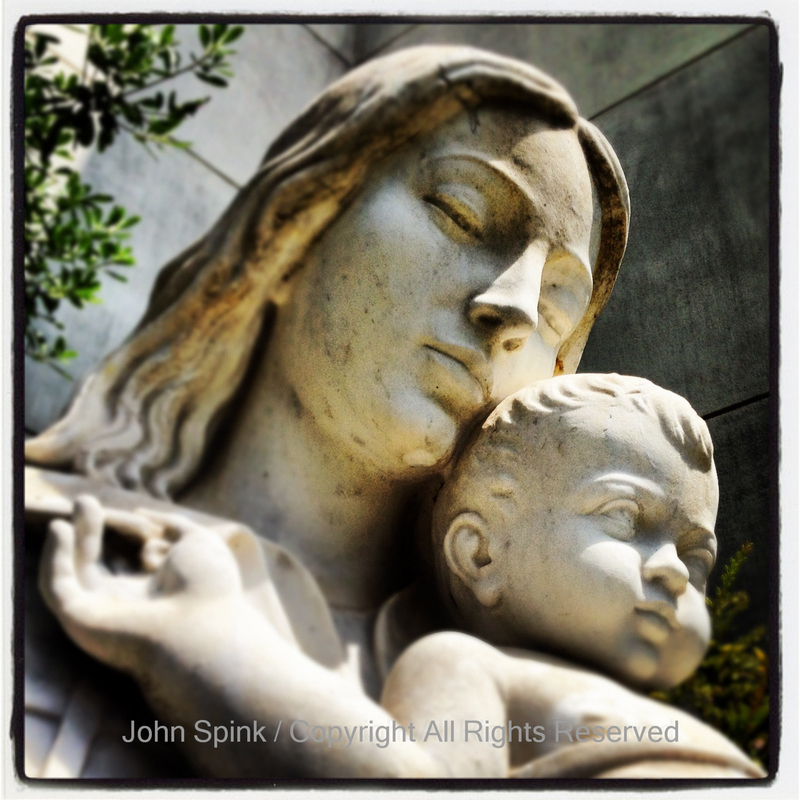 When Mother Teresa visited Atlanta in 1999 to open a new house (Gift of Grace) to serve women dying with AIDS, she chose Sacred Heart Church for her Sisters to attend; and it was this same church Mother Teresa chose for her visit. The church was elevated to the dignity of minor basilica by Pope Benedict XVI was on February 22, 2010. Over 1,580 churches worldwide have been honored as basilicas. There are now 69 in the United States and only one in Georgia. Inside is amazing liturgical décor and art. The twenty-eight stained glass windows, from the Mayer studios in Munich and were installed in the church in 1902 and are themed from 12-different Rosary meditations. 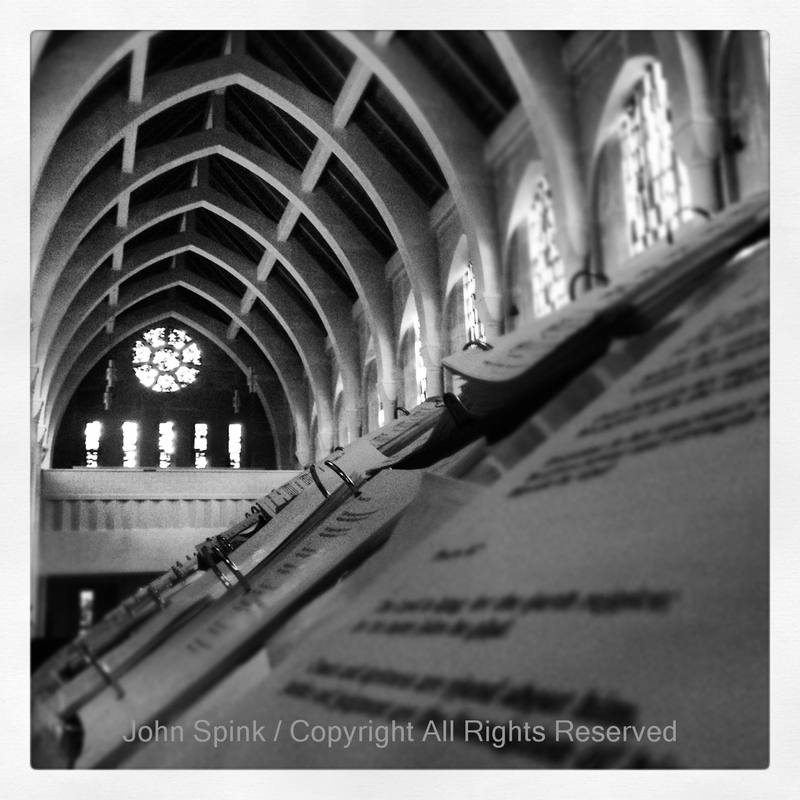 The church is beautiful! Thomas worked above and I worked below. 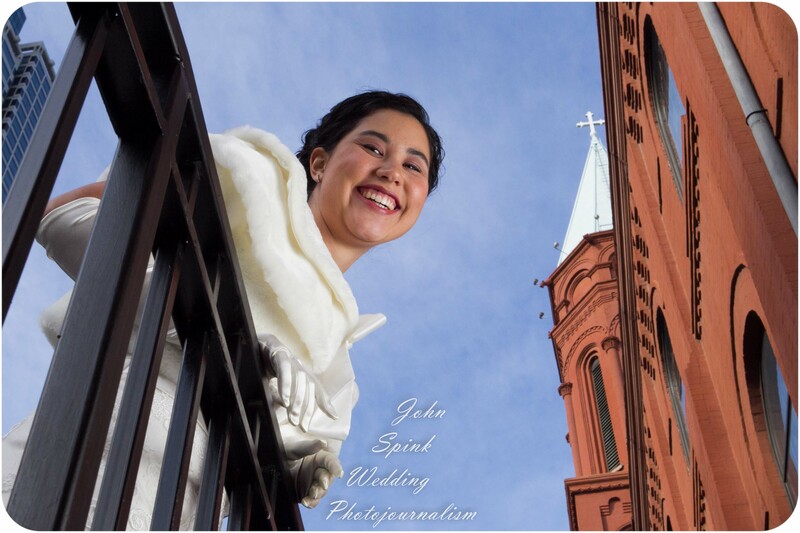 John and Elizabeth chose the old Decatur Courthouse in downtown Decatur, Georgia for their reception. Elizabeth has a special liking for downtown Decatur, so it was a fitting choice. The afternoon reception provided plenty of daylight streaming in from the tall windows there much to the photographers liking. 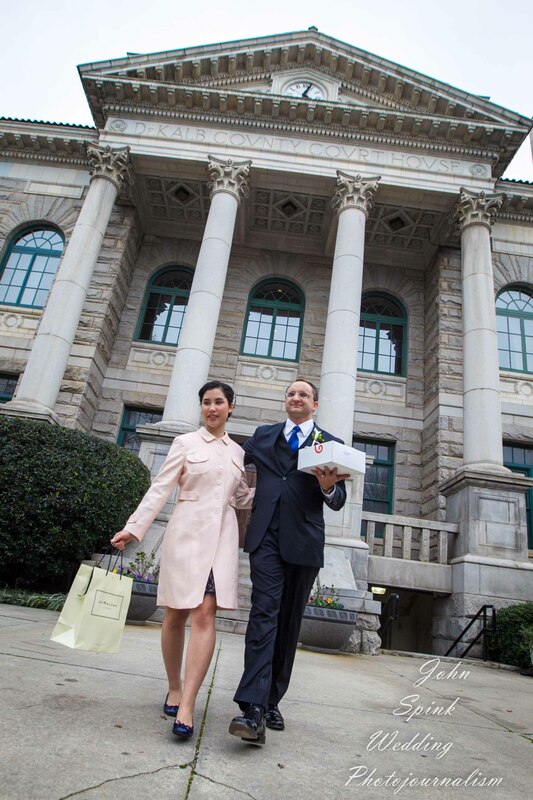 I remember covering other stories at the old courthouse through the years – so seeing it as a wedding reception venue was a new experience for me. The best thing about iPhone Photography? No thirty-five pound camera bag and no cameras hanging all over you. Just grab your phone and make an image. 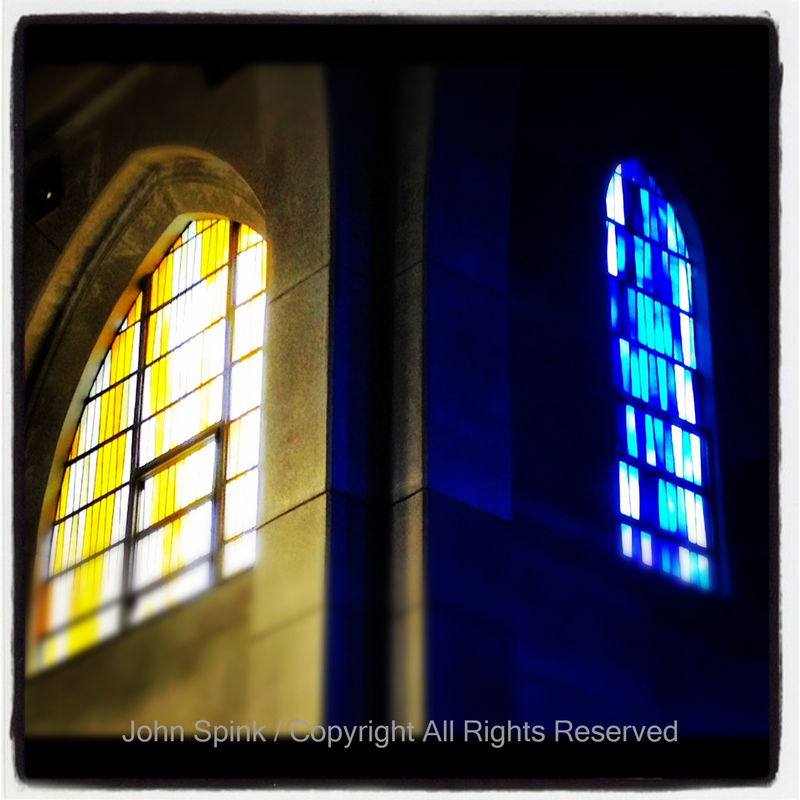 Here are some pictures I recently made with my iPhone at the Monastery of the Holy Spirit in Conyers, Georgia. 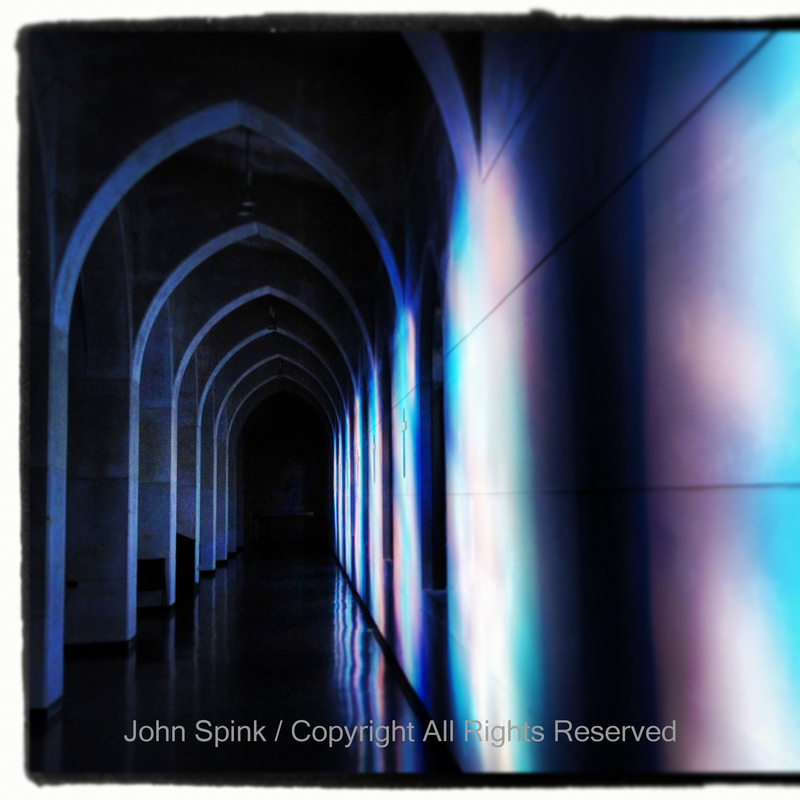 Here’s three different looks at the same corridor in the Abbey Church. It’s easy being creative with iPhone photography. 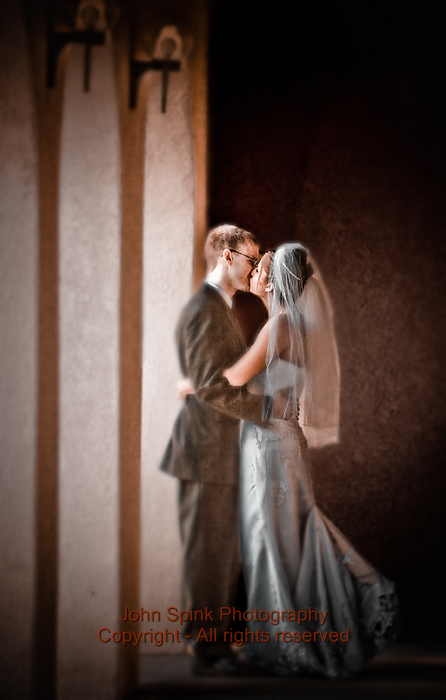 Here’s a little tilt and shift application you can apply with a photo software ap. Just plain beautiful light with a little contrast adjustment. Switch to black and white mode easily. 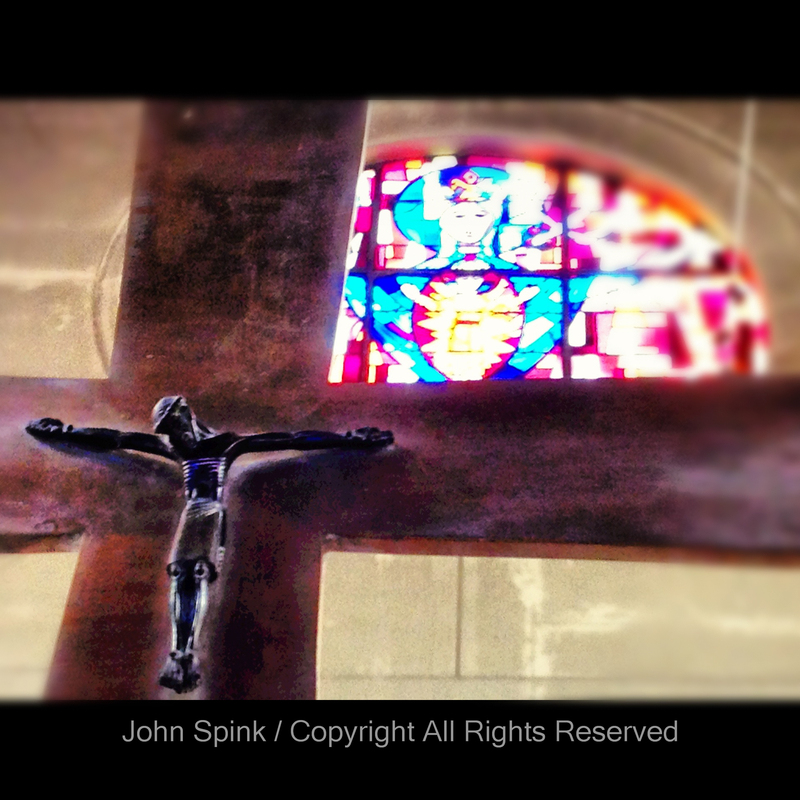 With iPhone Photography you can add your own borders. A blur here and a blur there for effect. Look up and see there’s pictures to be made. Look around and see the colors and contrasts. Look up and get close. 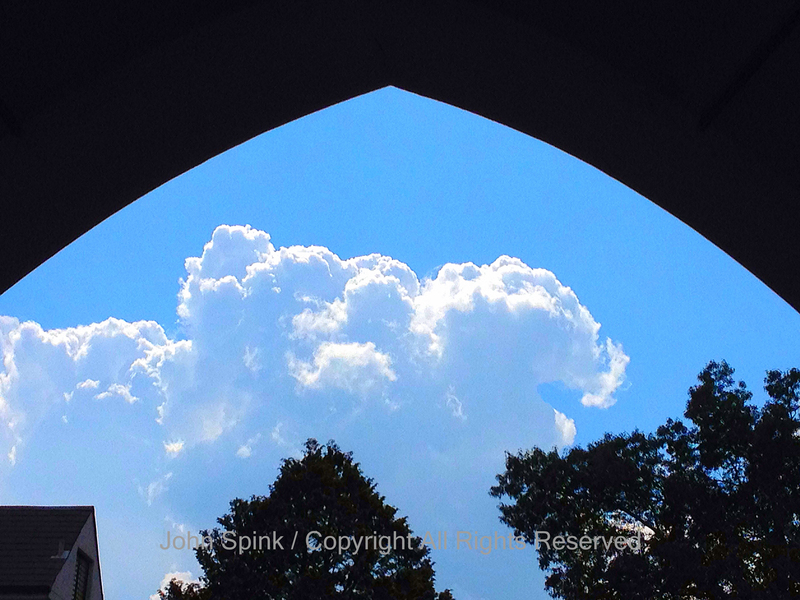 The sky is the limit ……. With Instagram you’ve got the basics to shoot and modify your iPhone images and share with friends and other photographers. Like Facebook, Instagram recently brought some concerns to users in regards to who actually owns the photos posted. This deserves to be monitored as this news develops and where it goes from here. I’m a big fan of one Instagram user in particular, and he’s not a professional photographer. 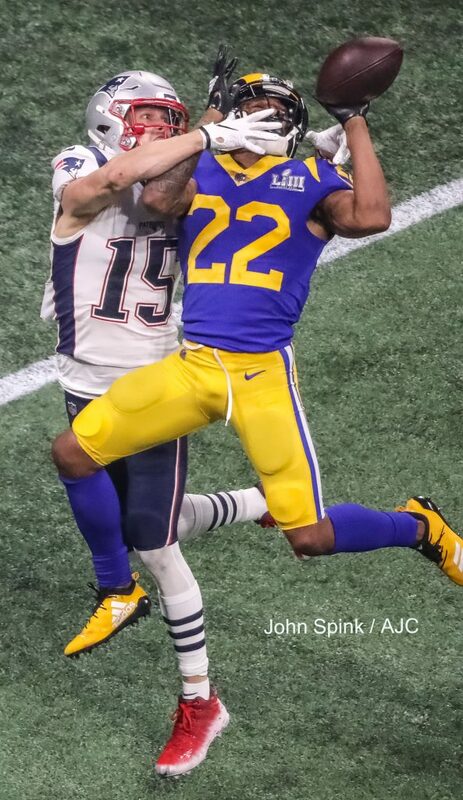 Richard Elliot, a reporter with Channel 2 Action News has a tremendous eye and a iPhone photo-ap arsenal that apparently rivals Adobe’s Lightroom and Nik software combined! 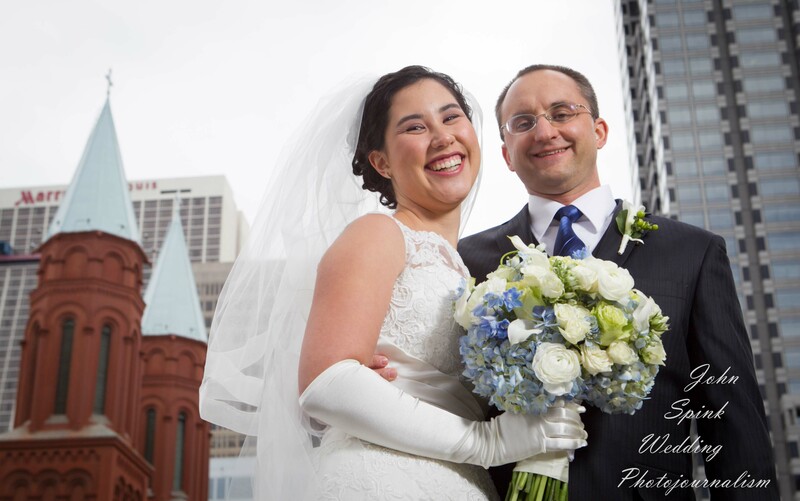 You can see Richard’s work at grantparkphotog on Instagram. It’s ART! 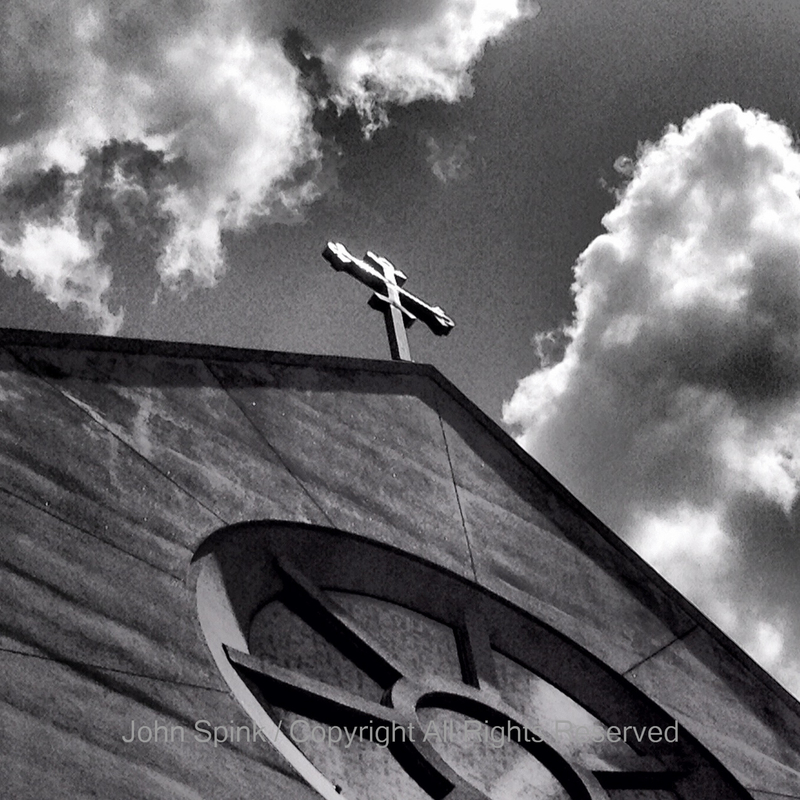 You have limitations with iPhone photography. The files are not as big as DSLR and you certainly don’t have the lens selection or optical aperture choices. 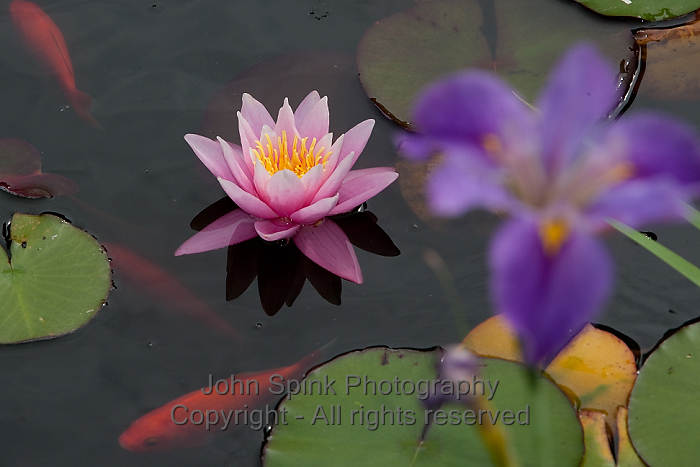 But if you don’t want to be weighed down like a pack mule, like most professional photographers on assignment, then you will love the convenience and freedom of having a camera in your pocket with some Lightroom capabilities at your fingertips. 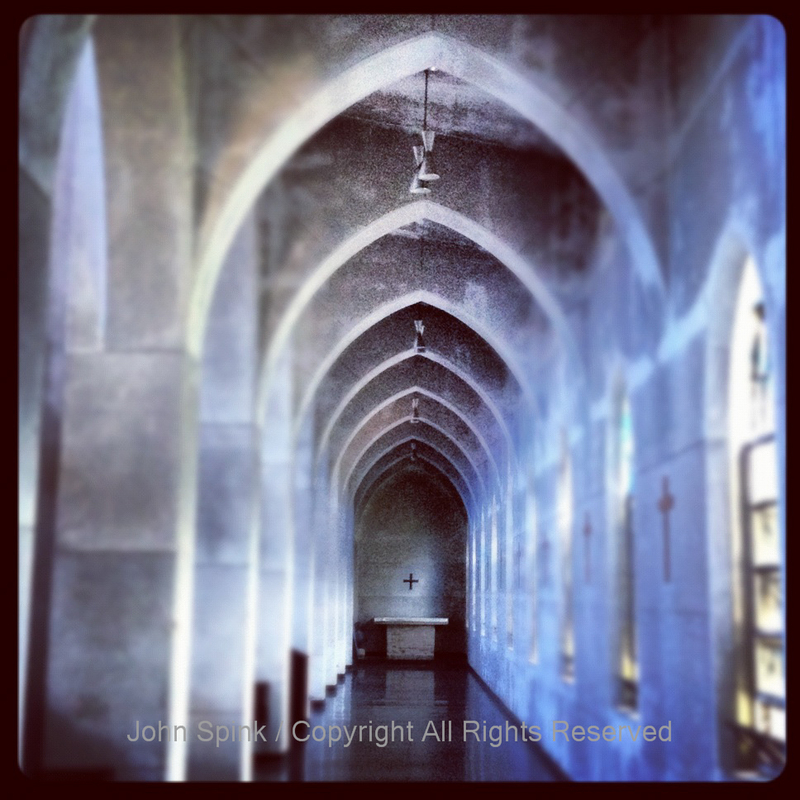 The Monastery holds a Photography Retreat once a year that I am privileged to be part of. 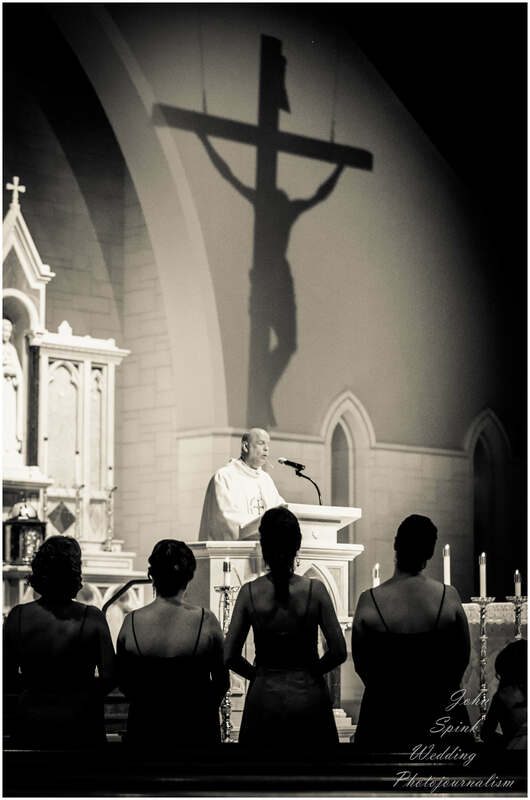 Father James Behrens, a monk at the Monastery is a prolific writer and a photographer. 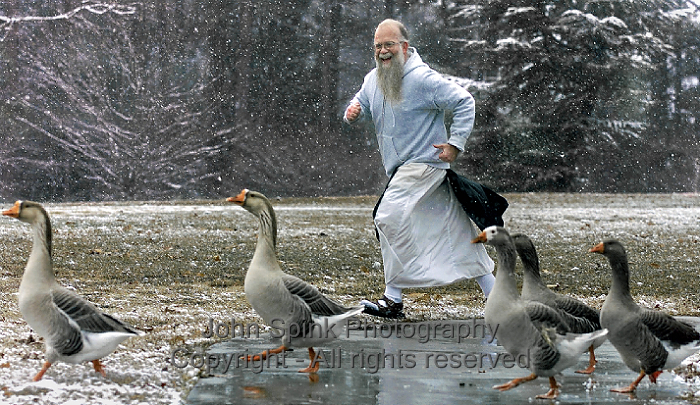 He along with Matthew Jeffres, a nature and food photographer who is on staff at the Monastery. 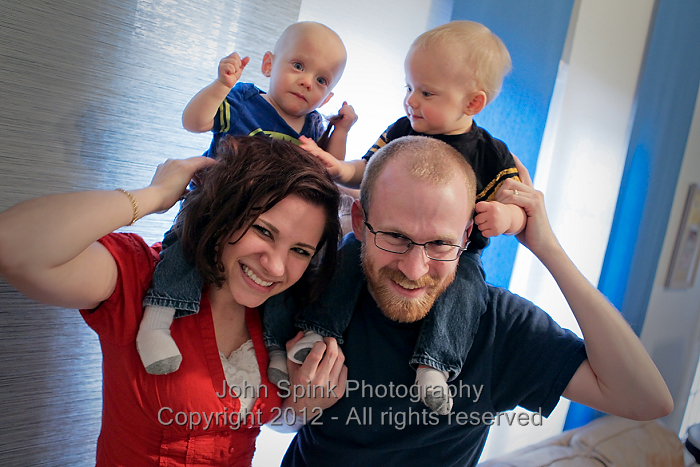 And yours truly, will help to lead a great weekend retreat of coming in touch with God and photography in May of 2013. Come join us! Humanity is made in the image and likeness of God. 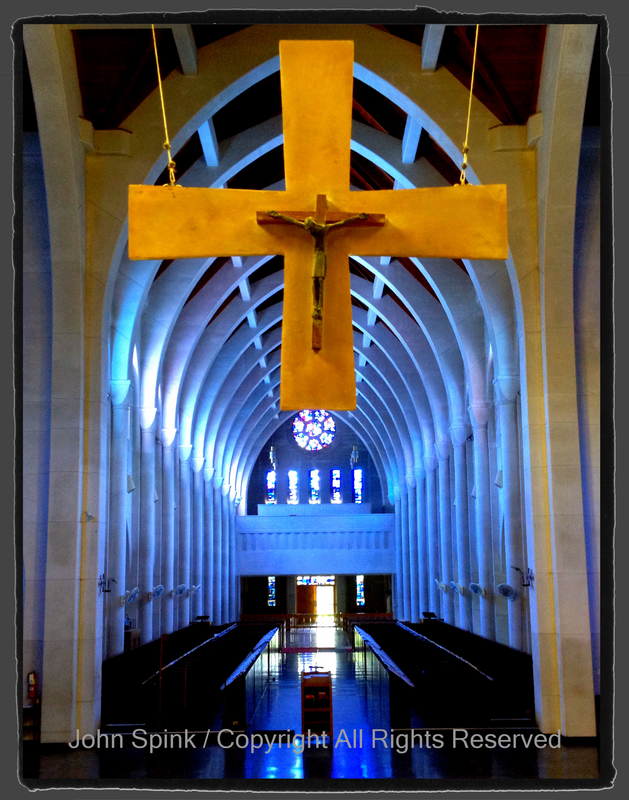 Photography, at its best, can bring to view beautiful images that evoke a powerful sense of God’s presence in our world. 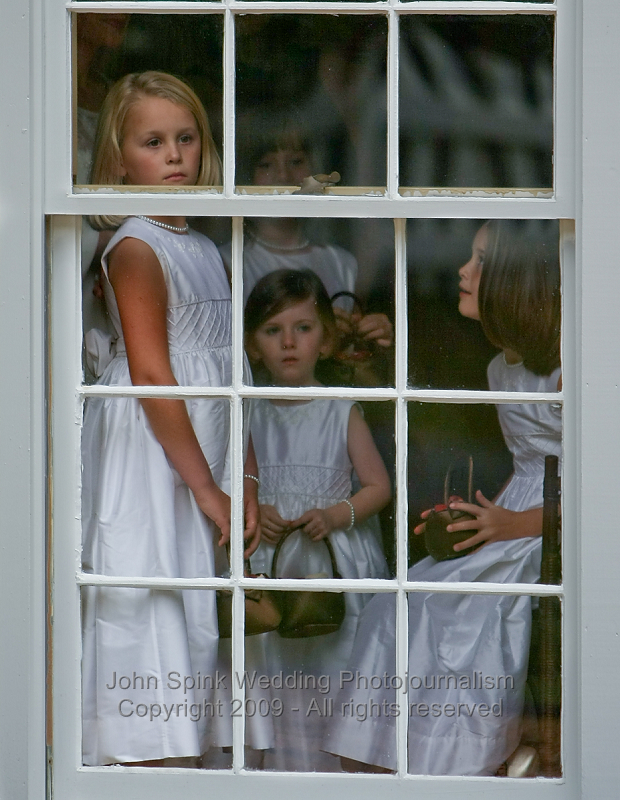 John Spink, a well known Atlanta photographer will share his insights and images. 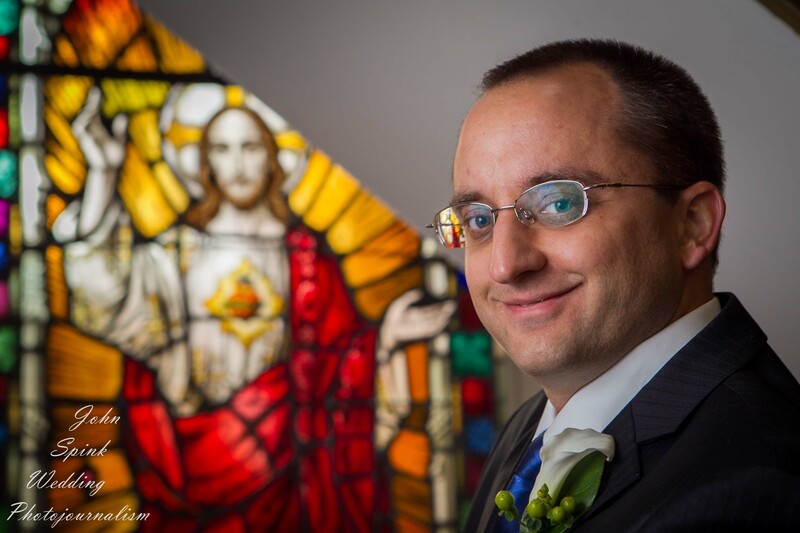 Matthew Jeffres is a friend of the monastery and will also show his nature photography. Fr. 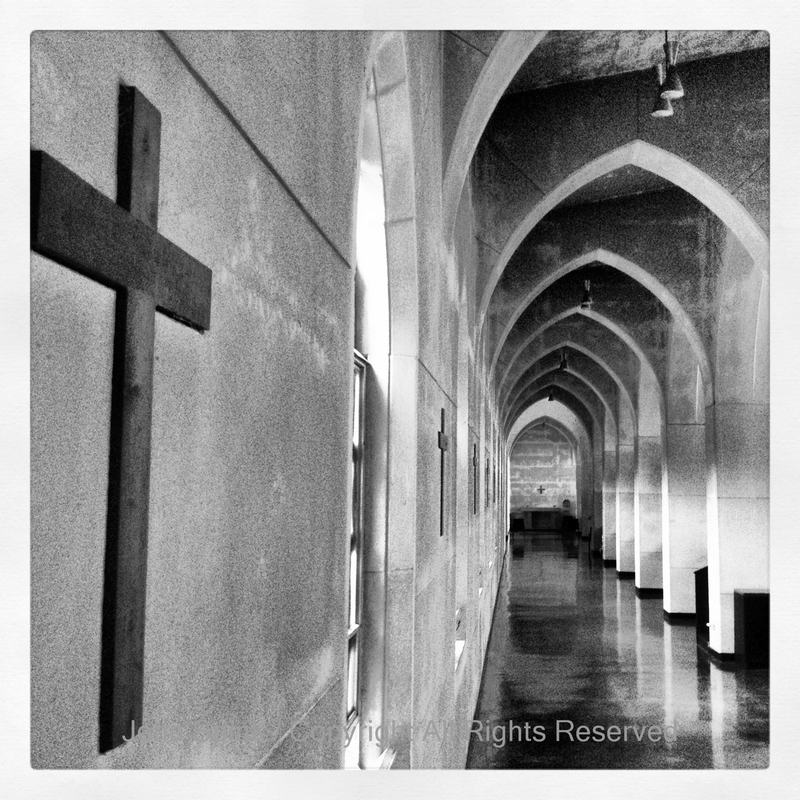 James Behrenswill lead the retreat and share his photographs and comments on faith and the photographic imagination. 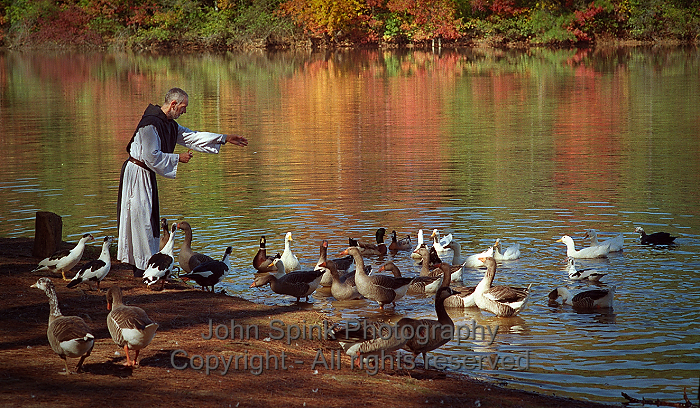 We’ve been associated with the Monastic community in Conyers, Georgia for several years. A few years ago Fr. James Behrens a monk, author and photographer asked me if a retreat on photography would be well received by the public. 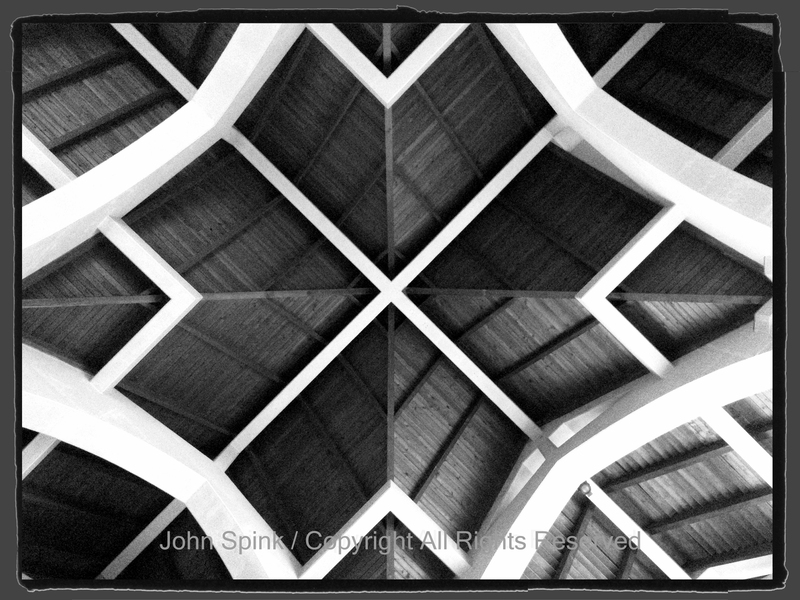 We agreed to give it a whirl and the annual retreat has drawn people from various faith backgrounds to come and share in the atmosphere and rhythm of monastic life while attending a photography seminar. Presentations on the work of Henri Cartier–Bresson, James Nachtwey and photography work by the team has filled retreatants with a richness and depth that have stirred the senses and soul. Fr. James Behrens continues to fascinate me in his perspectives in both literary and visual communication. His many books have been great guides for opening the mind, senses and soul to the world around us. Matthew Jeffres love of nature and keen insights into allowing ourselves to be still and receptive is something many of us have lost or never had in our fast paced technological culture. Here Fr. 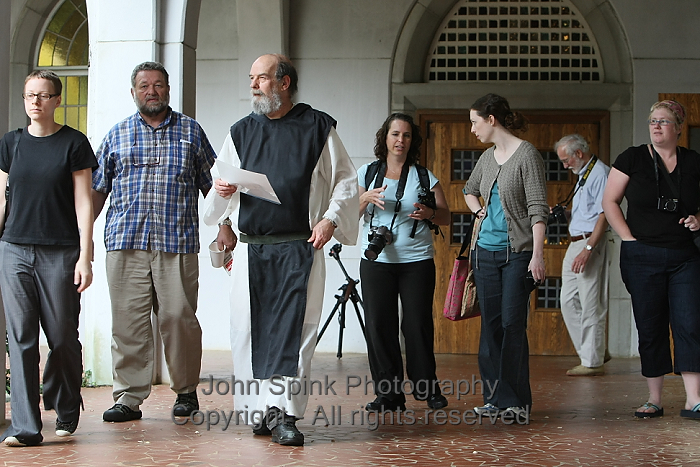 James (left-center) leads the group during one of the shooting sessions in the cloister. I’m looking forward to another great weekend of sharing, learning and meeting everyone who will come to one of the most unique retreats to be found in the photographic or spiritual community. 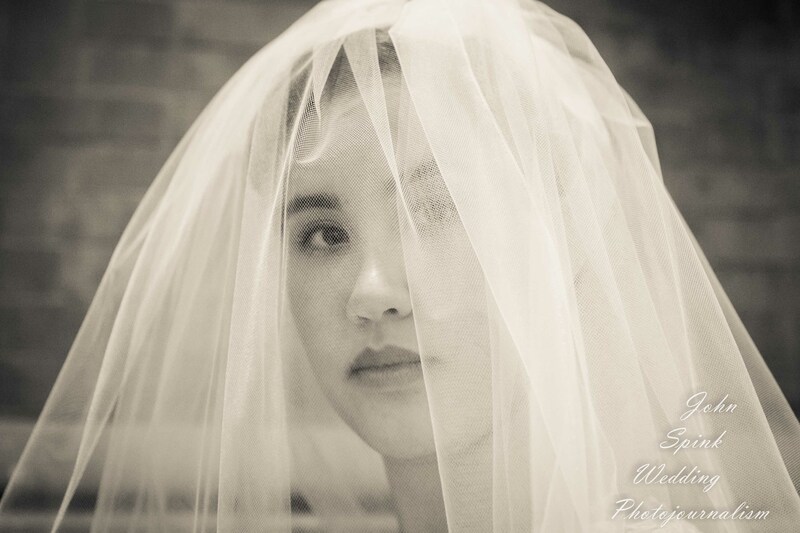 Wedding Photography? 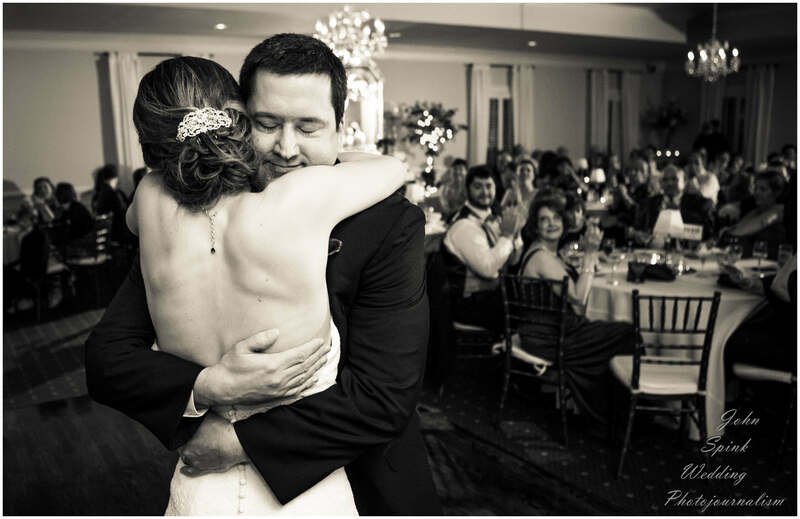 Oh, yes – the wedding of the photographic mind and the soul for sure! 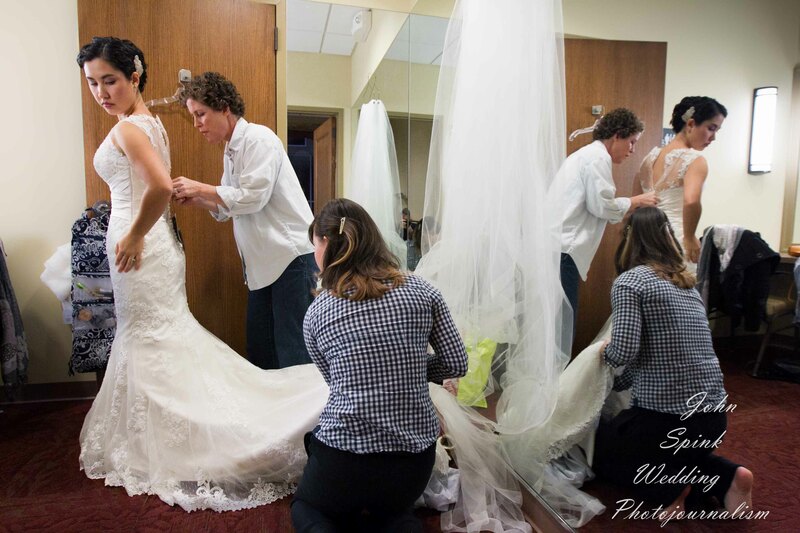 Who Will Be The Next Atlanta Bride? 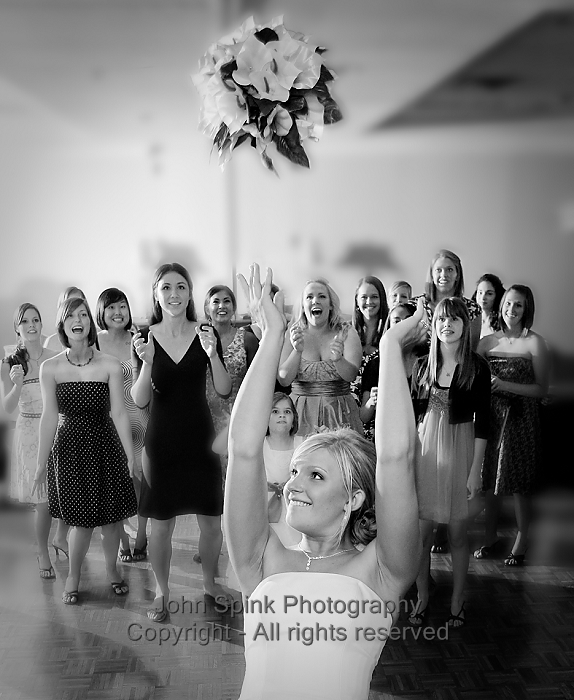 Like I‘ve always liked this image of Laura tossing the bouquet. 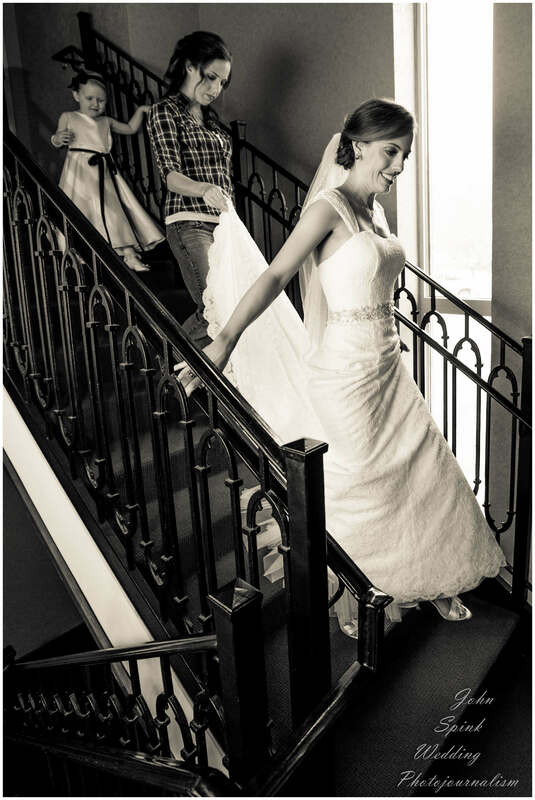 The most interesting aspect of the picture isn’t so much Laura, but the faces of the ladies behind her. 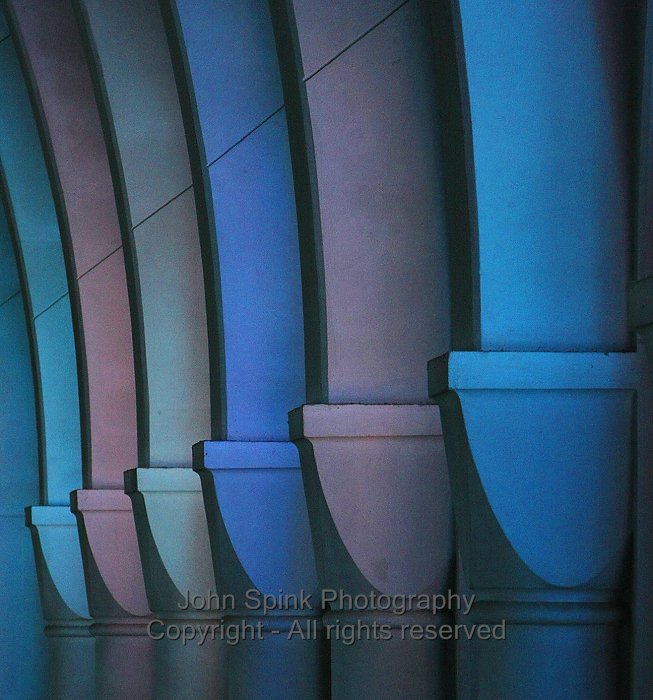 This was just one in a series of images where each image was a study in of itself. 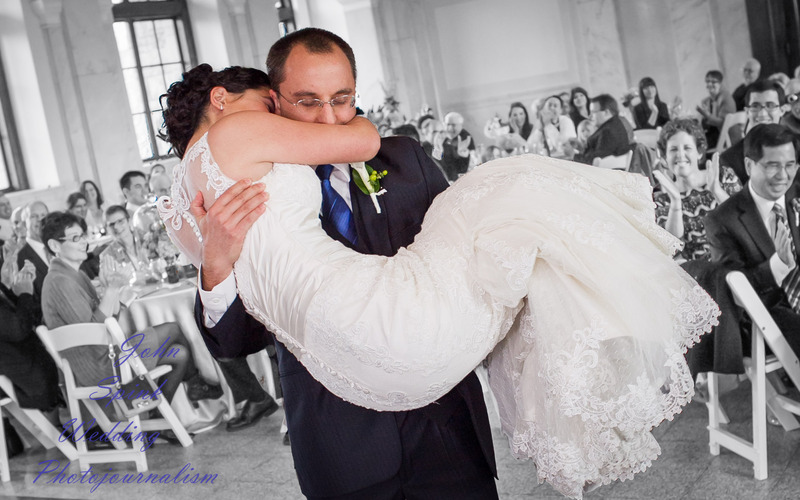 The best thing about our wedding photography is that our clients are provided with so many images – that you could literally spend hours just analyzing and enjoying them for photography sake. 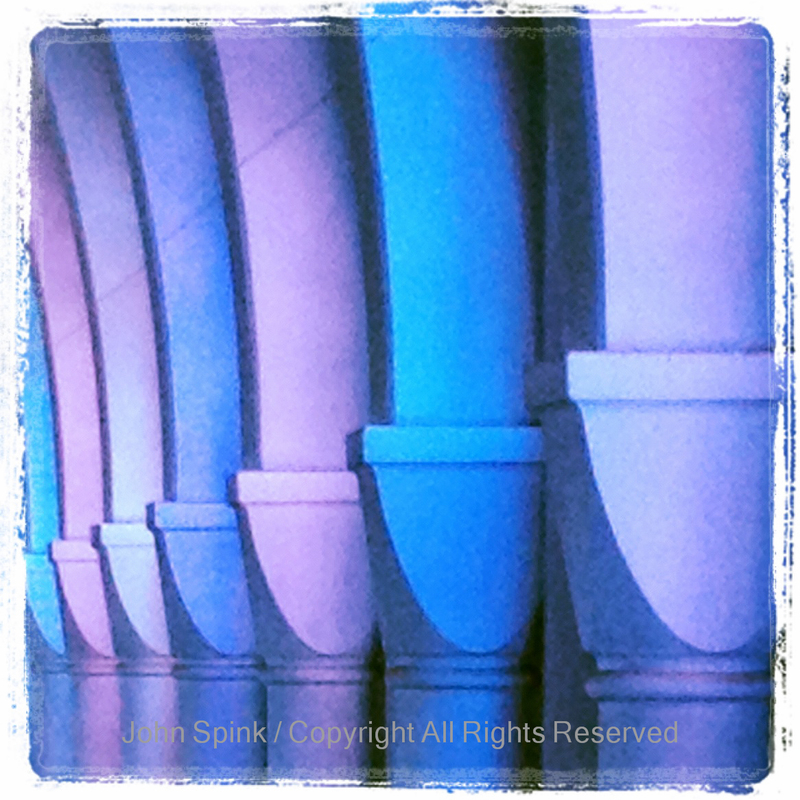 You gotta think John Spink – so come see us on Facebook or Twitter and ask about our unique approach. 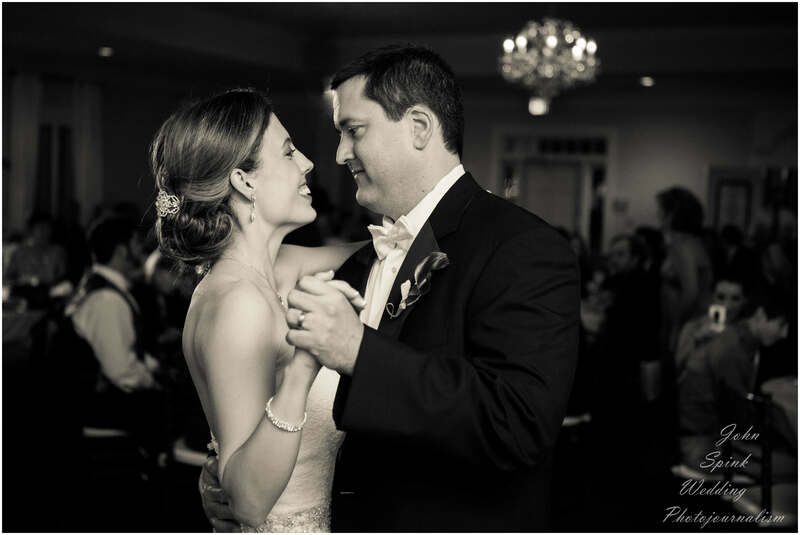 Every Atlanta bride deserves to have a memorable collection story book images. Our team provides just that. I know, shameless self-promotion. 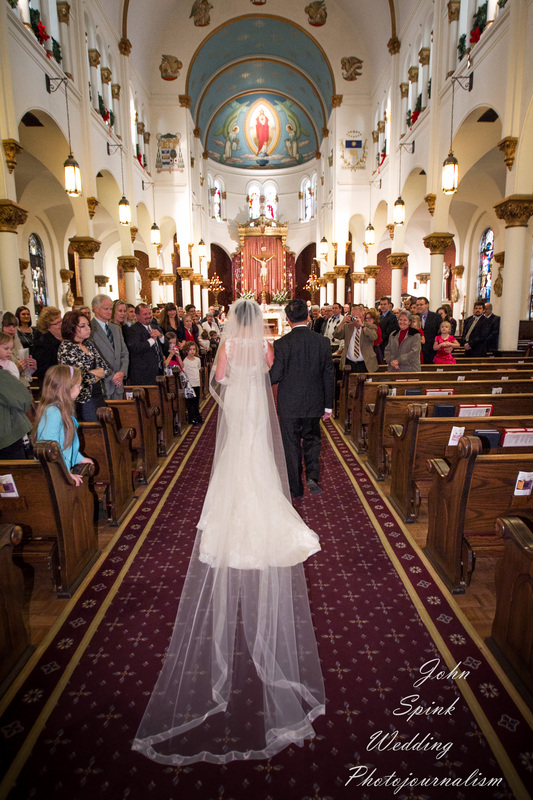 Scott and Kristen were wed at St. Lawrence in Lawrenceville. 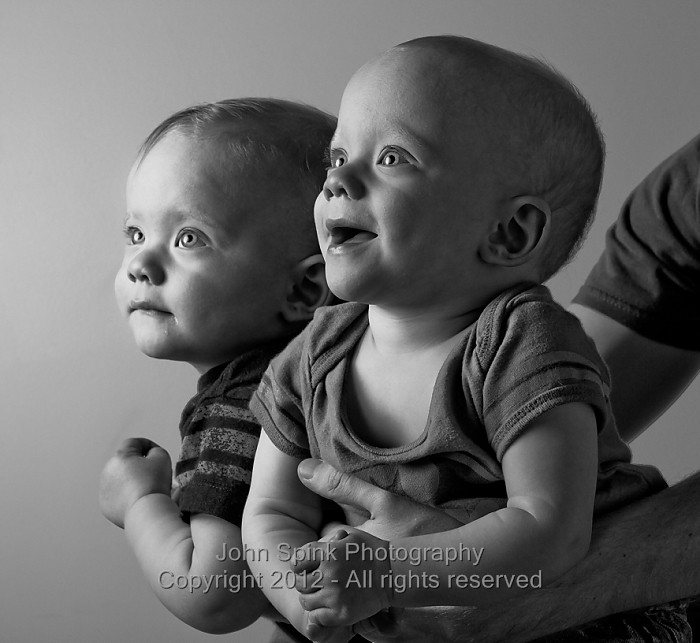 Not so many months passed and then – instant family – TWINS !!! 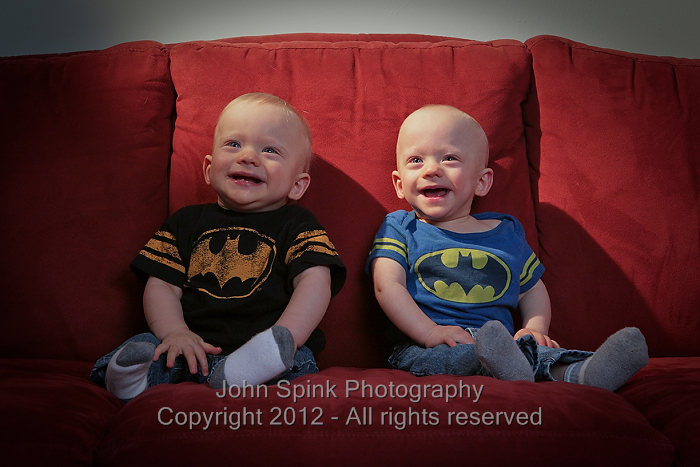 With twins – smiles aren’t always synched – so this was a good one! 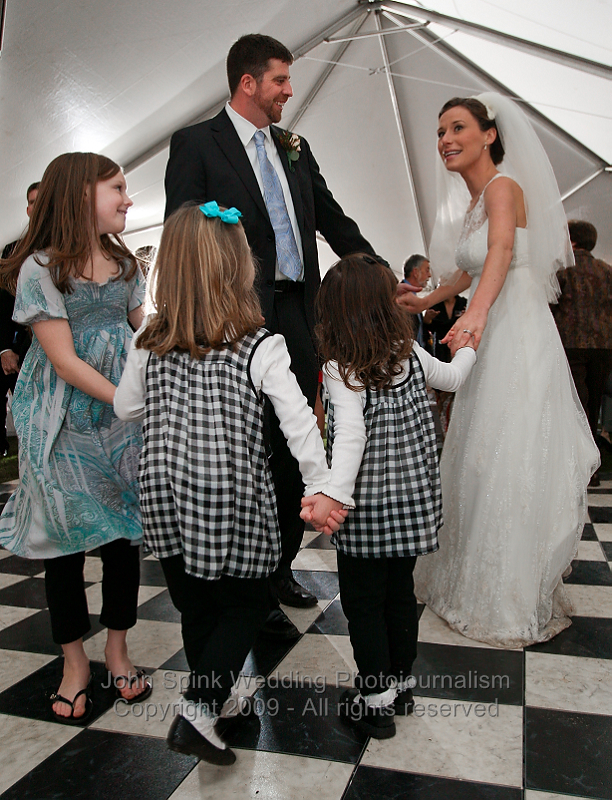 Weddings bring a whole new experience for children to explore. 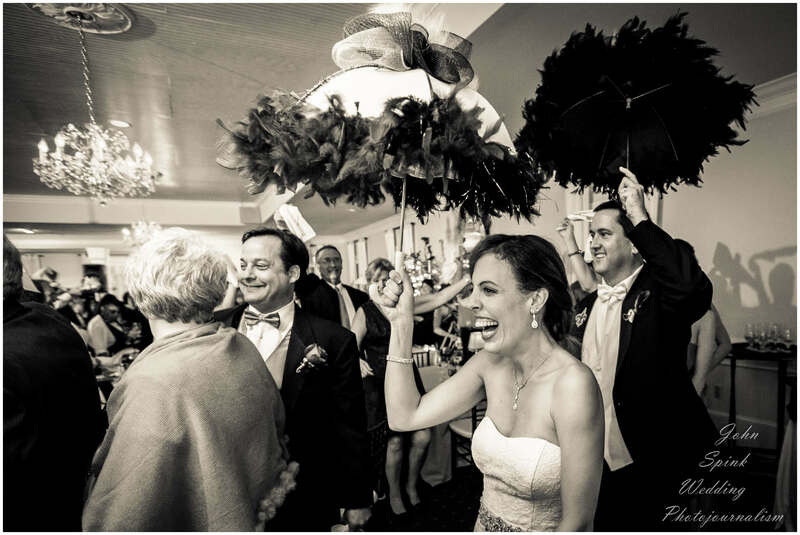 It is probably their first encounter with pageantry, pomp and circumstance – and they love it! Most of them do……. 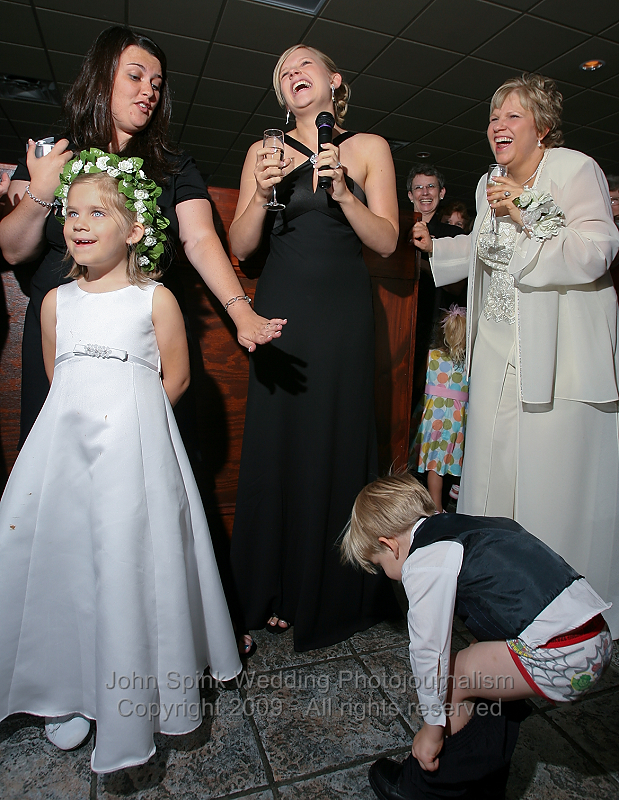 except the occasional reluctant ring bearer or flower girl. 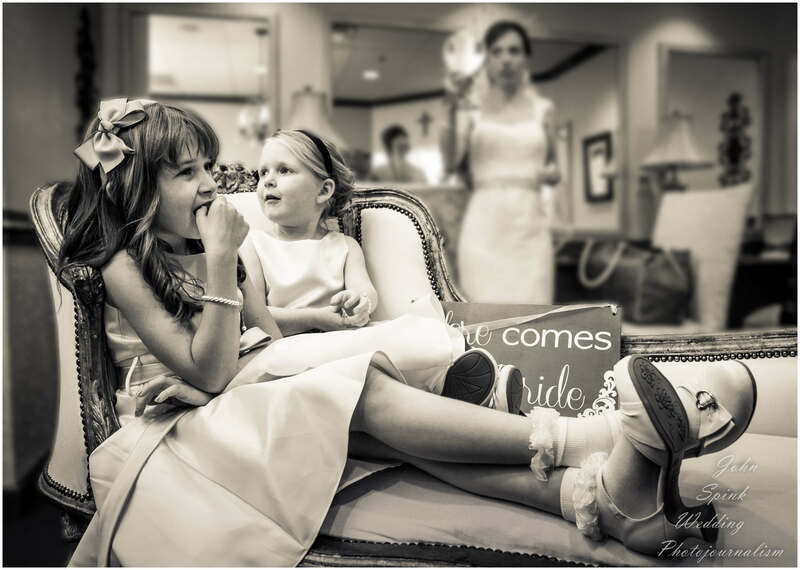 Little girls and boys are amazed at how beautiful the bride looks and stand-off staring in awe at this fairy princess, larger-than-life. 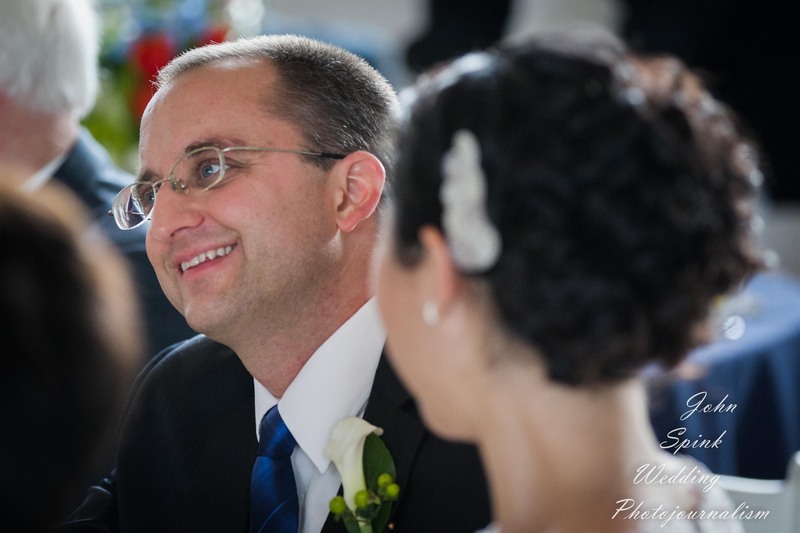 The groom – just like in the movies! 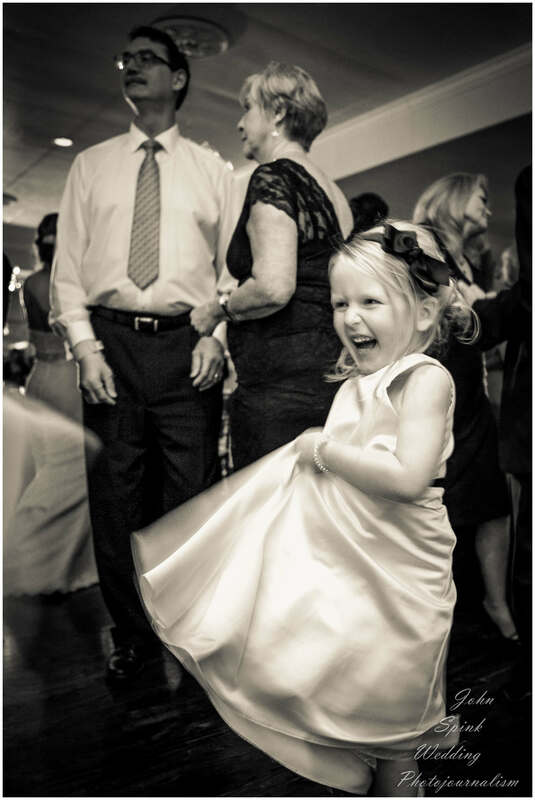 This usually lasts until the reception, when they discover their dance partner is either the bride or groom and then they have a new playmate. The dance floor becomes a playground and bottled up energy finds its release there. 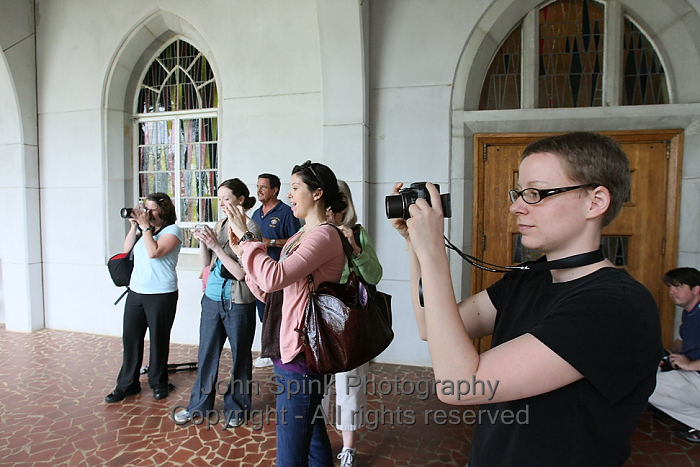 That’s also where a good number of pictures are made at least at most of the Atlanta venues I have been to. 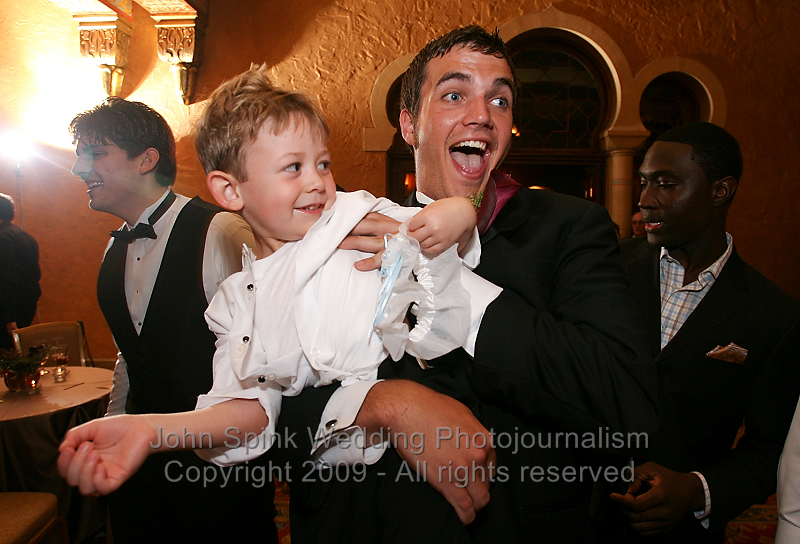 However, great pictures of children can be made throughout the wedding day you just have to be looking for them. 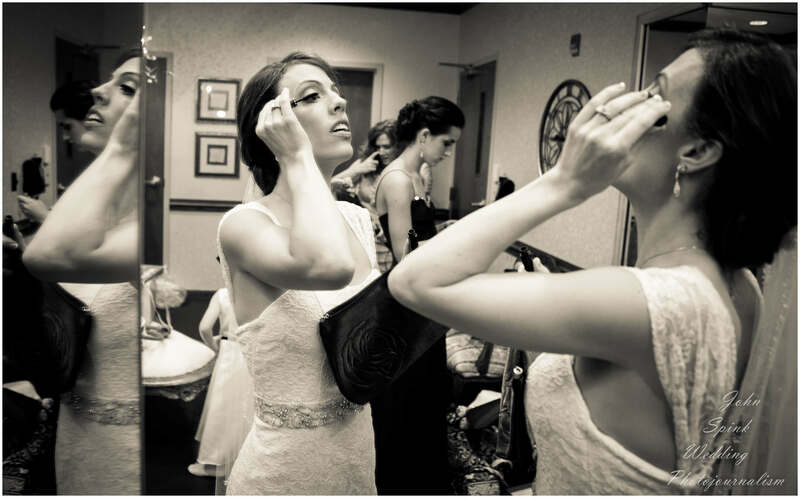 As a photojournalist, I’m using a camera to tell a story, looking for all kinds of people, moments and events that mark the day like compass points. 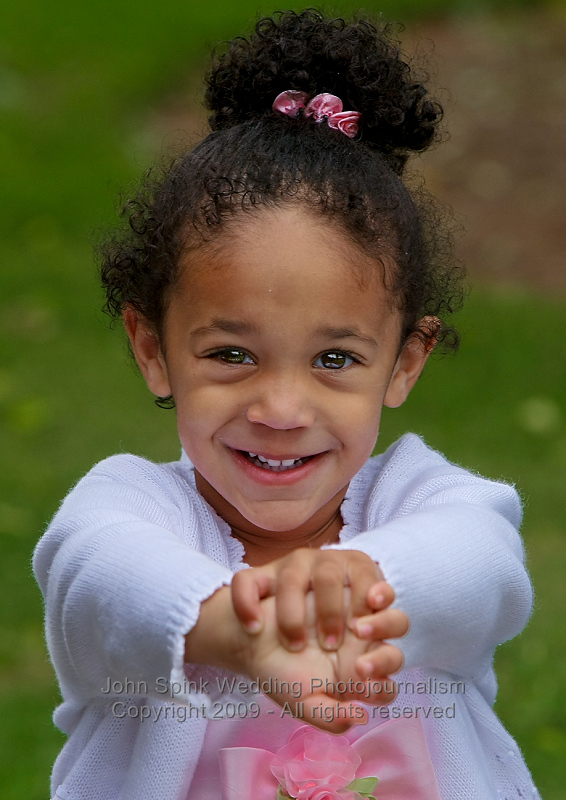 Children often bring energy and a sparkle to the day. Nieces, nephews and cousins nowadays are spread all over the United States. It’s important to have these relatives in the mix of your photos because the next time a couple sees them may be months if not years down the road. 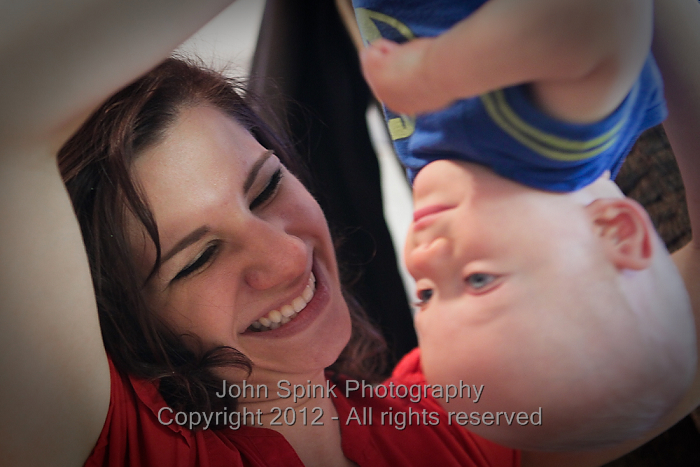 There are cute moments, embarrassing moments and just plain beautiful pictures to be made of children. 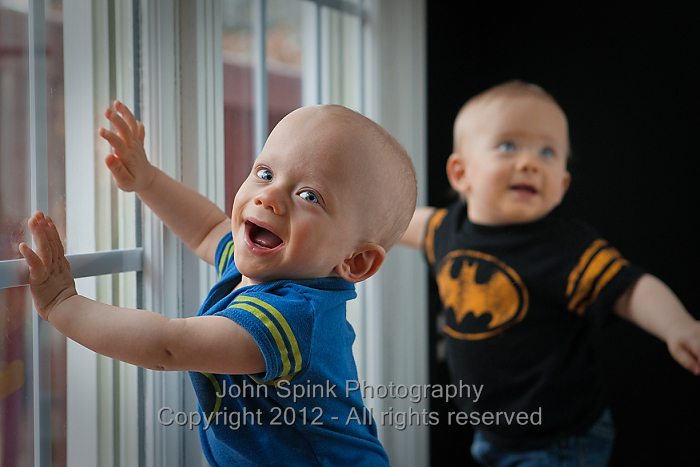 Having these pictures made in photojournalistic style brings a whole new look and life into these photos – different than a point and shoot grip-n-grin. Ready to be framed, unique and professional, these photos capture a moment in time of a cherished young face.